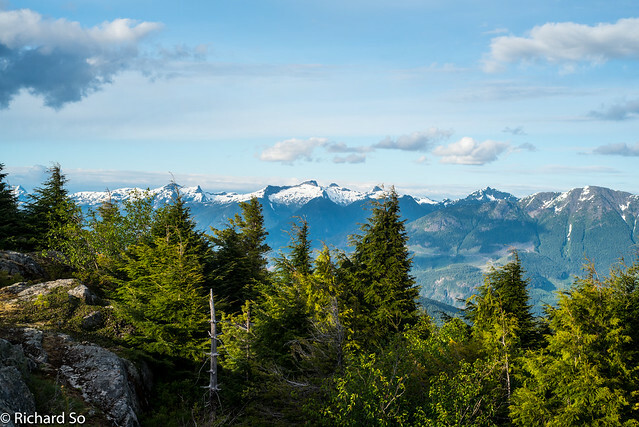 Highlighting expansive coastal and mountain vistas, meandering through old-growth rainforest and dotted with trailside huts, the 180-km Sunshine Coast Trail is a world-class hiking route just a half-day trip from downtown Vancouver. 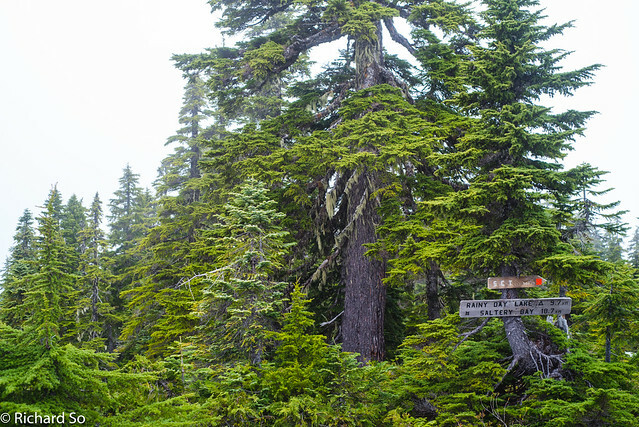 “The Sunshine Coast Trail is Canada’s longest hut-to-hut hiking trail—and the only free one. 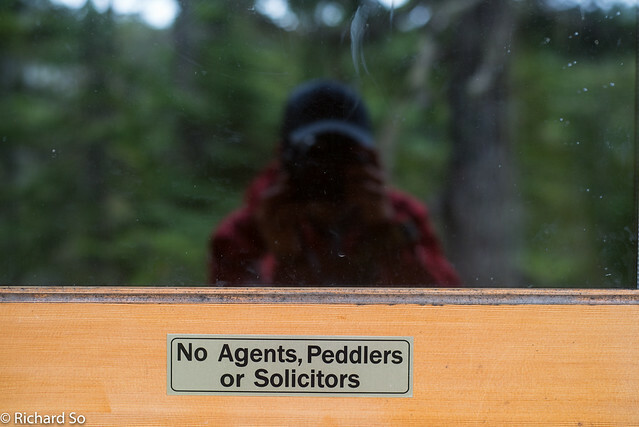 This is our claim to fame,” explains Eagle Walz, trail co-founder and president of the Powell River Parks & Wilderness Society who maintain the trail. The summer of 2016 has seen more local and international visitors that ever before, for good reasons. 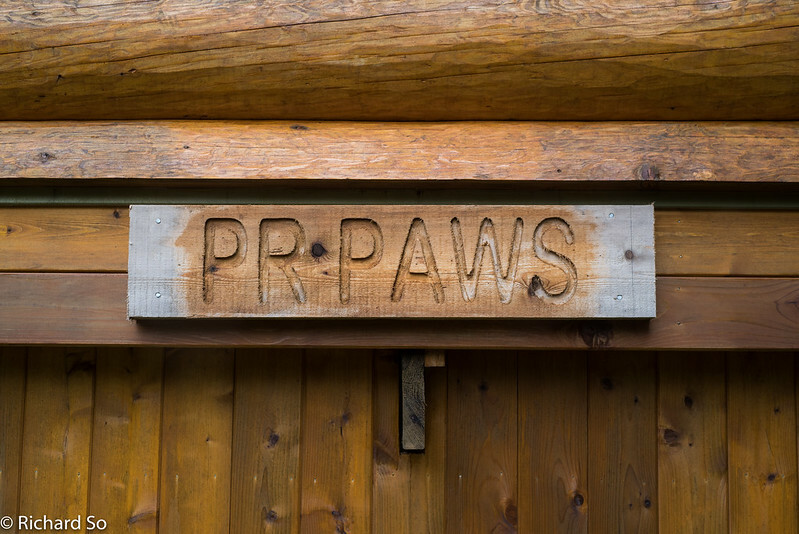 The PRPAWS has continued with their hard work on maintaining the trail, managaing any issues between the trail and Western Forest Products, and even adding another hut at Confederation Lake this summer. The trail is in better shape than ever before, and this summer the Fastest Known Time was set by Dylan Morgan in 31 hr and 55 minutes. I was well overdue for a visit to Powell River and the Sunshine Coast Trail. In December 2004, Jennifer, Tom and I hiked from Sarah's Point to the Shinglemill Pub after my first semester at UBC. They picked me up from UBC after my last exam and we caught the last connecting ferry to Powell River. 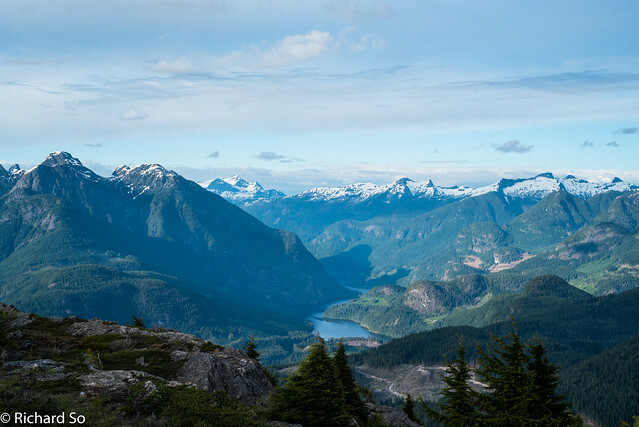 We got a ride up the logging road towards Sarah's Point, hiked along Okerover Arm and out to Powell River over three days on this 50km northern section. My most memorable memory of that trip was how poorly coordinated we were. We all met through the Varsity Outdoor Club and tried to organize this over the online message board. Jen didn't have rain pants or hiking pants and hiked the entire route in fleece pajamas and borrowed boots which ate both her toe nails. None of us had stoves, so we borrowed one from our friend Boris. Jen and Tom up on a mossy bluff. Check out Jen's hiking pajamas. My food planning was less refined than it is these days. It was the second and last night of the trip and we were camped up on a mossy bluff with a view of Vancouver Island. With only one pot and lots of extra food, Tom thought we could save time and cut weight by cooking all our separate dinners and food together. We had white rice, dry red kidney beans, oatmeal and Lipton sidekicks. Not surprisingly, it didn't turn out well and we went to bed hungry, not able to digest the crunchy rice and bean medley. We finished hiking the next day by headlamp, running down to the Shinglemill Pub in the dark, ready to eat all the food. This May, I skied the Stein Divide, from Lizzie Lake to Lytton over nine days. I was in awesome shape, aside from an injured shoulder that prevented me from going climbing. We hiked as much as we skied on that trip, so a long distance hiking trip, with a light pack seemed like a natural extension. I was looking at the weather forecasts for the long weekend and thinking of something fun to do. 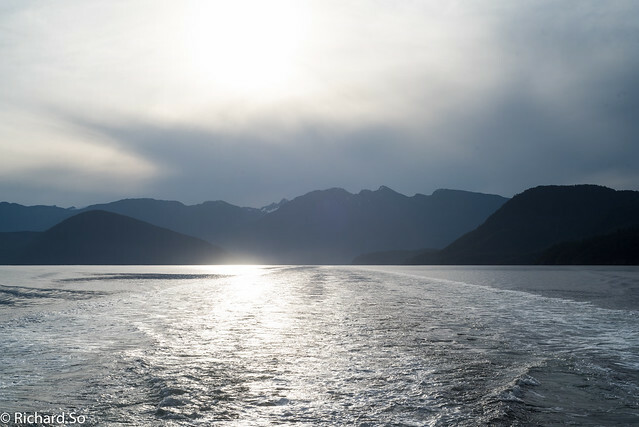 The weather looked better to the west and north, with just a trace of precipitation forecasted for Powell River compared to Squamish or Manning Park. 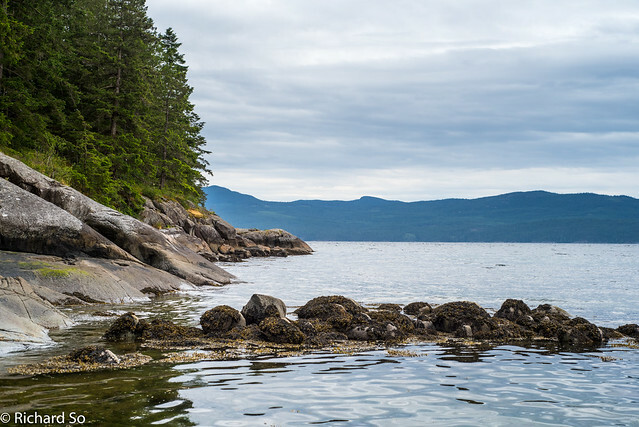 This was my chance to finally hike the section of the Sunshine Coast Trail that I haven't explored, either a shorter length from Powell River to Lang Bay or all the way to Saltery Bay seemed like the best way to spend the long weekend. I wanted to go solo too. I would have nobody to complain to if the plan didn't work out and it was just a big sufferest, or if my weather forecast was wrong and it actually rained. The backup plan of hanging out at Townsite Brewery didn't seem so bad. I've done plenty of fast and light trips in the mountains. This would be my first attempt at fast packing on a trail. The gear was fairly simple but not on the lighter side. I took a 35L packback, three days of food, the usual essentials like a DSLR. 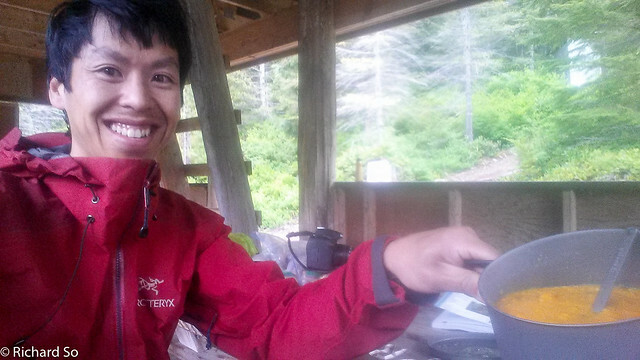 With food, stove and pot, the pack was still close to 20lbs. Compared to my spring ski expedition pack, this was featherlight. I wasn't sure if I could run with it on the first day, but I hoped to fast-walk as much as I could. 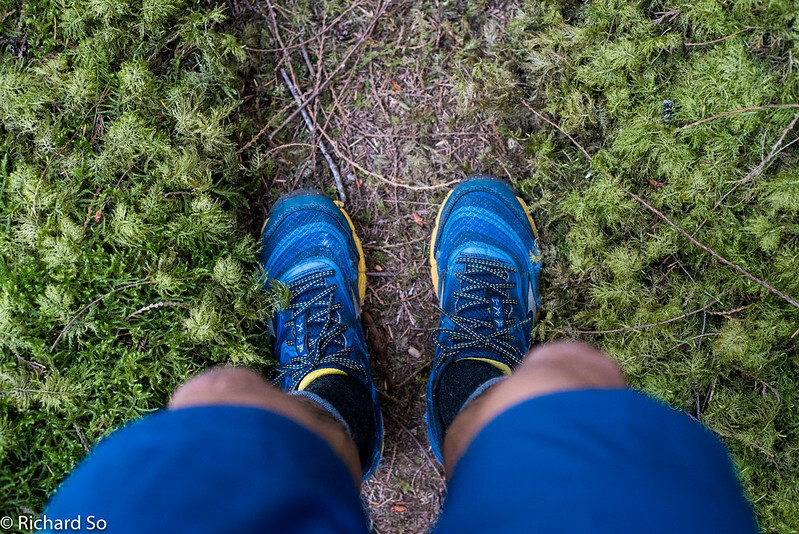 I used a pair of Mizuno Wave Kazan, an all-around trail shoe. There are some technical sections on the trail, but there is also a lot of old logging roads. 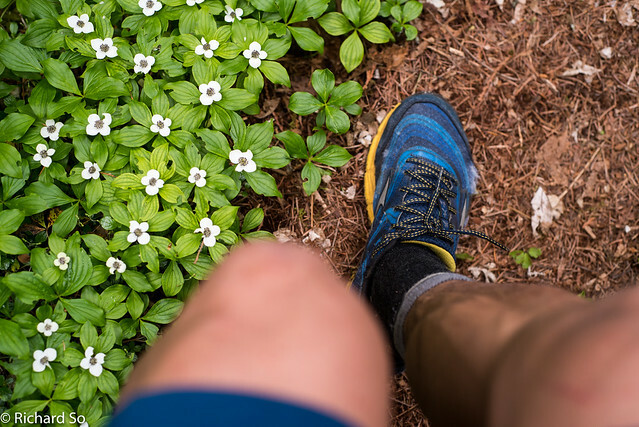 These shoes seemed fine for the terrain, where comfort is as important as traction. I spent all winter skiing so I wasn't sure how that translated to hiking and jogging fitness. As far as jogging goes, this was mostly an off the couch effort as I only ran a handful of times that spring. 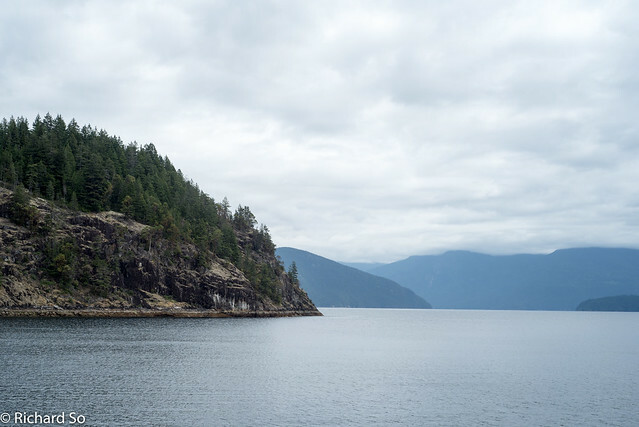 My usual route goes along the Baden-Powell trail, either from Cleveland Dam or Lynn Valley down to Deep Cove, 25km to 12.5km. I call these my donut runs. One Harmony donut for every 12.5km of running. 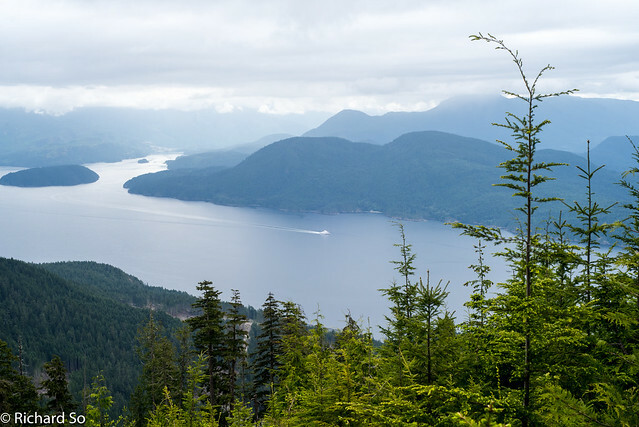 It turns out the terrain on the Sunshine Coast trail was quite similar to the moderate-easy sections of the Baden-Powell trail. The view from the 6:30am Saltery Bay ferry, leaving the clouds behind in the wake. I wanted to catch the 5:50pm or the 7:50pm Horseshoe Bay to Langdale, in order to catch the 10:30pm ferry from Earl's Cove to Saltery Bay. But it was a long weekend, there was a two sailing wait. I showed up at the ferry terminal at 5:30pm, but didn't get to Langdale until 11pm, catching a delayed 9:45pm sailing. I drove across to Earl's Cove and slept in the back of my car in the ferry lineup. 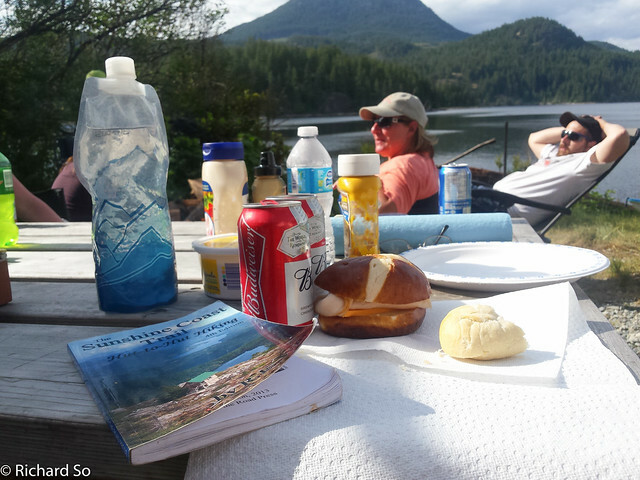 I spent hours reading through the Sunshine Coast Trail guidebook by Eagle Walz. The book is setup for thru-hikers from north to south. 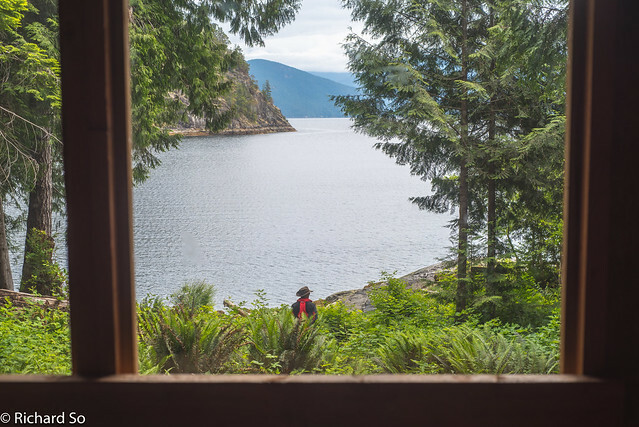 Many people hike the Sunshine Coast Trail as shorter sections, and the book includes descriptions on how to access the trail from various points. I printed off a map from the Sunshine Coast trail website. My plan was to drive to Lang Bay, park the car and hitchhike to Powell River and hike back to my car. 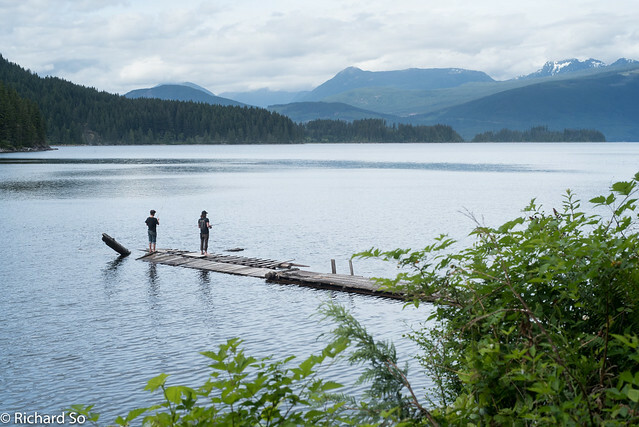 Powell River to Lois Lake. That would be about 85km, plus a few extra kilometres of hiking down Dixon Road (wide gravel logging road) back to the Lang Bay Store. If I hiked to Saltery Bay, there would be more distance, plus I'll need to hitchhike again back to my car. Maybe I could have coordinated a ride by asking around in the morning while waiting for the 6:30am sailing, but I was still half asleep. You can arrange to leave your car behind the Lang Bay store, $5 per day. I changed into my "running costume" and watched as most of the other cars drove through. How much local traffic could I expect on an early Saturday morning of the long weekend? I walked down the road, towards the Lang Bay hall where the #12 Stillwater bus stop is. This bus only runs on weekdays, so I was out of luck today. I was prepared to wait for two hours, until all the cars off the next ferry sailing drove through. If I was still waiting then, I would call a taxi. After about 40 minutes, a local picked me up. David, a ex-logger, motorcycle mechanic and snow plow driver, drove me right to the Shinglemill Pub, nowhere near where he was going today. And when I told him I was hking to Mowat Bay and beyond, he asked why I didn't just ask to be dropped off there. The locals are friendly. I set off from the same place I finished from twelve years ago. 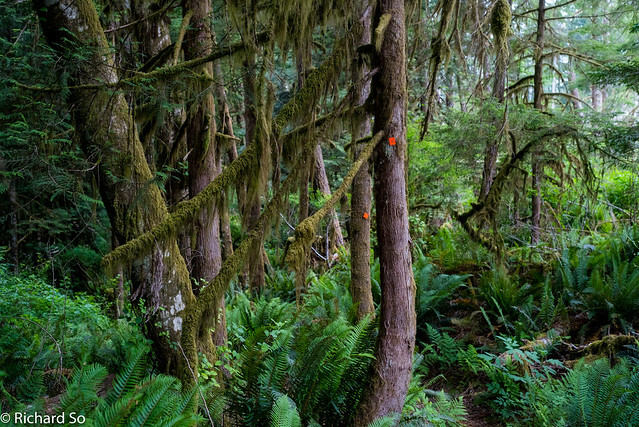 The Sunshine Coast trail is well-marked, with orange trail markers. Square trail markers are for south bound and diamond trail markers are for north bound. Eagle Walz recommends that everybody hikes the trail from North to South. Consequently, the trail is way better marked for the southbound direciton. With everybody hiking in lockstep, you'll be less likely to see people. Some of the markers have rotated around the nail so squares may look like diamonds but it's not a big deal. There are new reflective markers in areas, but the majority were not. Flagging, often pink with "Trail" also guided the way. Remember to distinguish between flagging for the trail, and flagging for the boundary of cutblocks. 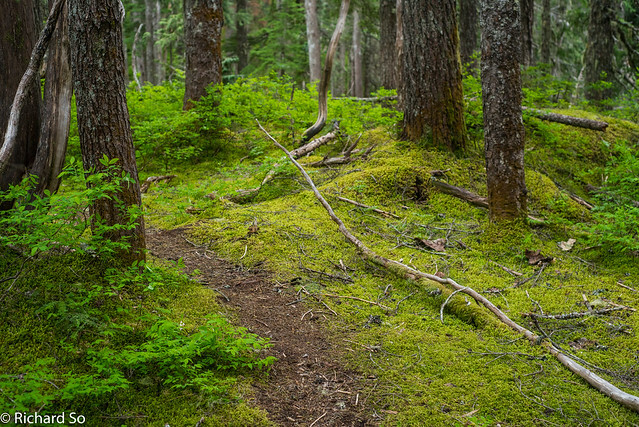 There is a good trail bed so if you're bushwhacking in dense ferns and crawling through deadfall, you've likely followed another confused hiker. Just backtrack and you'll find the right soon enough. I had that happen to me a few times when I wasn't paying attention, accidentally walking past a switchback. 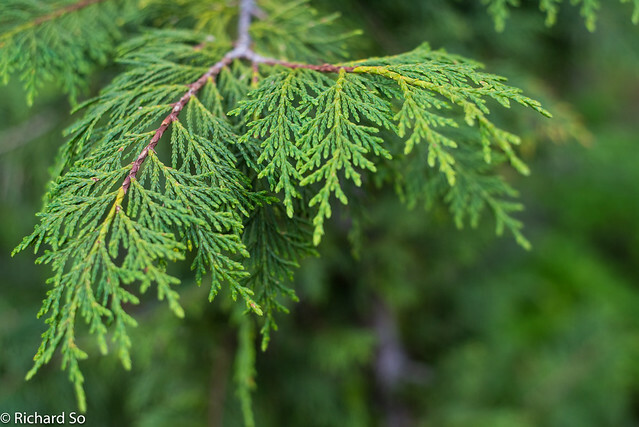 I had a general sense of where I was going, following lots of trail markers and making my way through the forest, through Mowat Bay, along Haywire Bay, past Lost Lake and down to Inland Lake. You could shorten the trip by driving to Inland Lake and starting the hike here. The trail around Inland Lake is immaculate, level, buff gravel designed for wheelchair accessed camping. I'm a terrible road runner, so this section of the trail was my least favourite. It was flat, so I knew I had to jog it to cover some distance. I was already looking forward to the climb up to Confederation Lake after a few minutes pretending to run. I took a break at the Inland Lake campground, where I filled up with water, and chatted with a local who was off to fish and described the Inland Lake trail as one of the better ones around. This first section of trail is easy. I was here at noon, three hours after starting from Powell River, 14km into the trip. 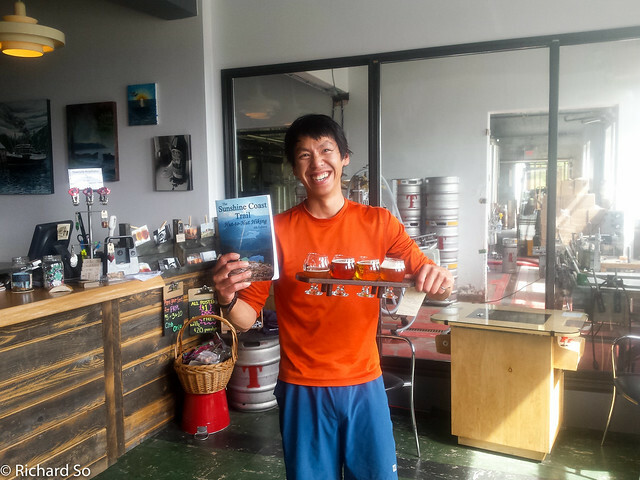 The Sunshine Coast Trail book was invauable. I frequently looked at the "SCT odometer," and flipped through the descriptions for each of the upcoming sections to get a sense of the terrain and time required and elevation gain. I broke the trip down into segments, and made sure to stop at all the huts to check them out and sign the logbook. Every kilometre is marked on the trail. 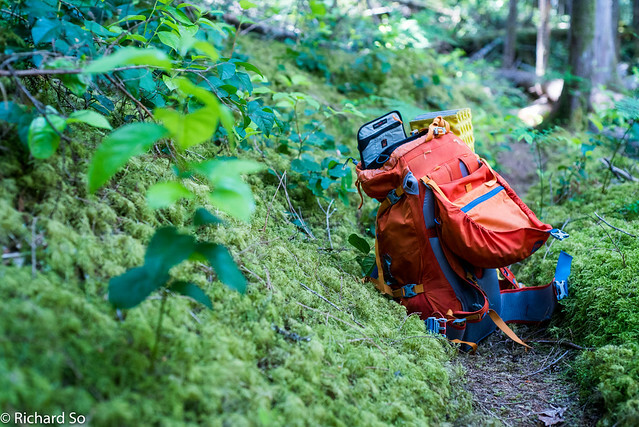 My not so lightweight alpine backpack, the MEC Apinelite 35. MEC has revamped the design and the new version is significantly lighter without all the unnecessary buckles and straps. The old Confederation Lake cabin. PAWS has been busy constructing the new cabin this summer. There are some great photos of the construction process on the very active Sunshine Coast Trail Facebook page. The first big descent of the day was down to Fiddlehead Landing on the shore of Powell Lake. 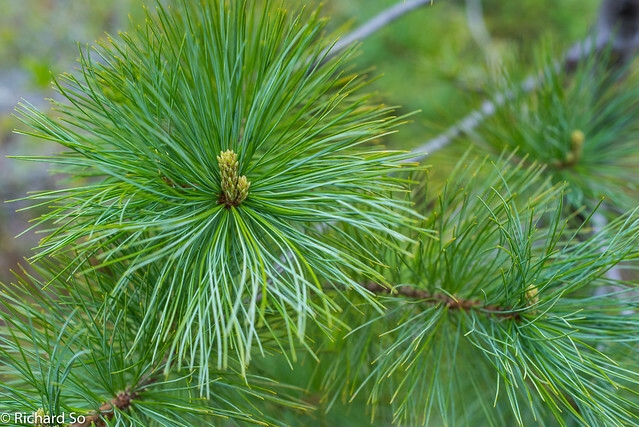 I jogged down through trail, a pathway of pine needles and loam with vibrant carpets of moss on either side. 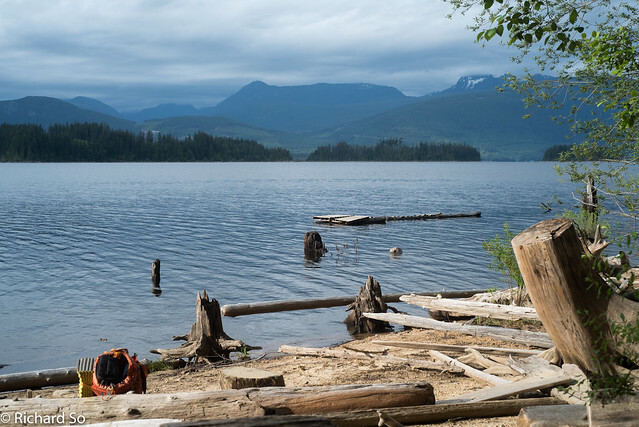 It was getting warm in the late afternoon, so I turned left at the Fiddlehead Junction and went down to Powell Lake to check out the cabin, a slight detour. I was expecting a crowd of people enjoying the nice waterfront cabin, but there were only two other people inside, two engineers from Kelowna and Toronto. I told them about my plan so far, they spotted my iron ring and laughed that it was a very engineer type of plan. I wanted to swim, but I've been experimenting with applying anti-blister foot cream on my feet (Nok Cream) and also taping them up preemtively. I didn't want to reapply everything, so I had to be content with dipping my head in. 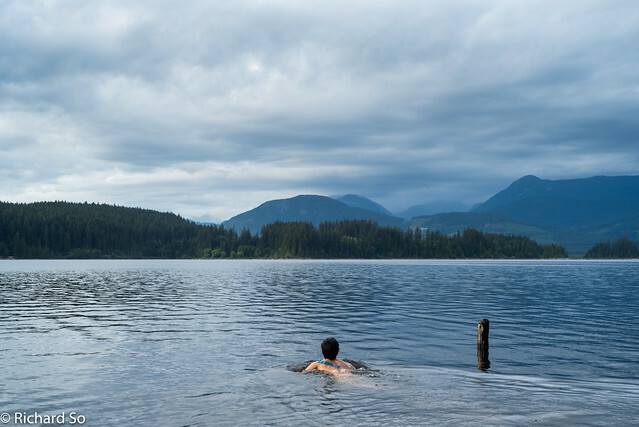 A part of me suffered inside as I was not able to do a lake traverse of the Sunshine Coast trail, unlike my swimming traverse of the Stein Valley last summer. The Nok cream works, I finished the trail without any blisters. Enjoying a break at the incomplete dock at Fiddleheading Landing. There are plans to float in the new ramp next summer. 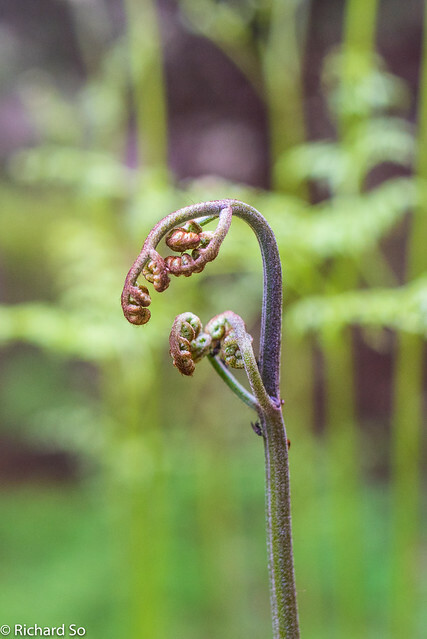 I walked back up the road to the junction and continued on the SCT, through the old Fiddlehead Farm, up old logging roads, into the forest. The Fiddlehead Farm was a remote retret and hostel. The property was sold in 2002, logging took place and most of the area is now grown over. 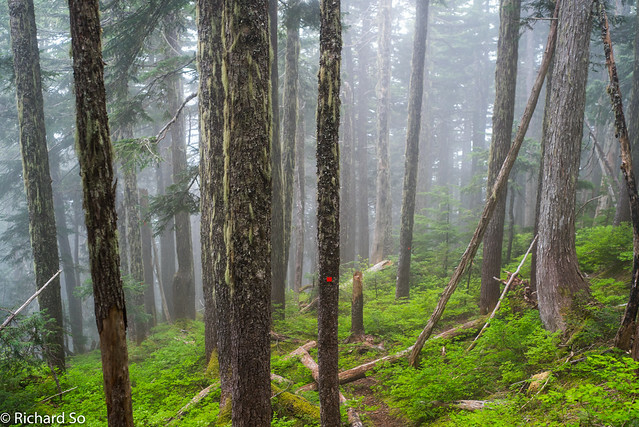 The West Tin Hat Mountain trail climbs from 150m to 1200m over 7km. There is no water up at Tin Hat Mountain, so I filled up on water in the creeks on the way up. I carried a 1L playtus and a Lifestraw. The Lifestraw was handy to use in any of the small creeks I passed by. It's been a dry spring and many of the creeks described in the book were already running dry. If I did this same trip later in the summer, I would bring a 2L bladder for the longer stretches between creeks. Snack Pack. A ziplock bag full on chocolate covered pretzel sticks. To make these, melt chocolate and coconut oil. Mix with raisins or cranberries and pretzel sticks. Spread on non-stick sheet and freeze until solid. Looking down at Haslam Lake, Powell River's source of drinking water. The penultimate climb to the Tin Hat Hut on an old logging road. There is more climbing in sub-alpine above the road. The view is spectacular up at Tin Hat Mountain, 40km into my day so far. You can get a great view of the South Powell Divide from up here, somewhere that's been high on my list of places to visit for a long time. The hut is below the summit, and was surprsingly quiet for a long weekend. I made it to the cabin at 6:30pm, just in time to catch Devin and Scott having dinner in the cabin. Ironically, both of these guys are semi-pro runners out for a weekend hike, in contrast to myself. I explained that I was only fast walking. Listening to my plan, they wanted to go "running" too. "I don't know. I'll just keep going until I'm tired. 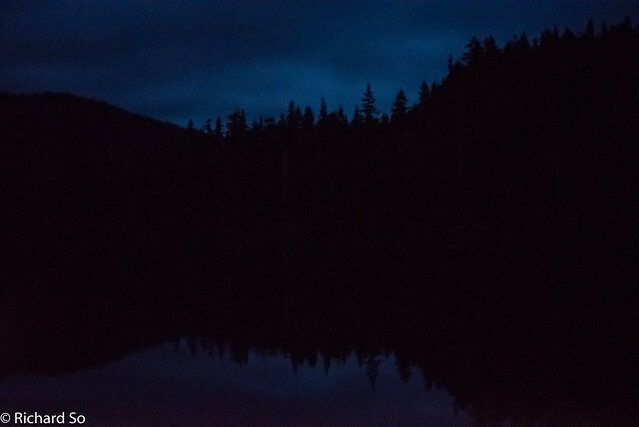 I think I can make it to Saltery Bay if I just keep moving instead of stopping here for the night." 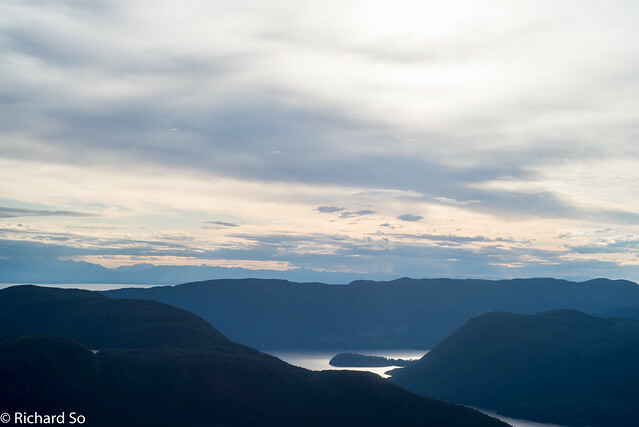 I hiked up to the summit to catch the evening view, five minutes above the hut. I came from over there this morning. The view over to the South Powell Divide. The Tin Hat sits in the most spectacular spot, out of all the huts on the trail. The trail now drops down into the cut blocks below, onto the forested ridge on the right, down its left skyline to the outlet of Lois Lake. It then continues along the far shore of Lois Lake, climbing up to Mount Troubridge on the right before descending down to Saltery Bay. Looking totally natural for the camera. This isn't posed at all. I'm just being in nature. Being contemplative. Wondering where I should have dinner. 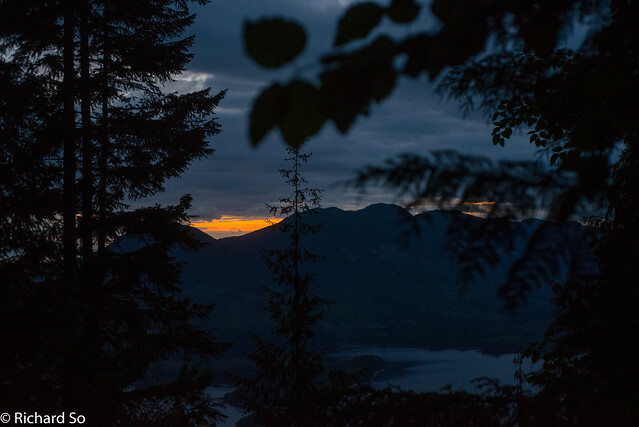 It was painful for me to leave Tin Hat Mountain, so close to the magic hour. I knew the sunset would be spectacular up there. But this trip was all about suffering and sacrifices. I jogged down the east Tin Hat Mountain trail. I bonked for the first time here. I struggled on the descent, finding the distances between the kilometre markings on the trees further than I hope for. I would learn to stop worrying about the distance markers and just listen to my body. I ran into a tree branch part way down which didn't help my morale. I made it to the Spring Lake Main, and worked my way towards Lewis Lake. I stopped for dinner on the shore of Lewis Lake at 9:30pm. I watched the trout jump out of the lake, as the sun dissapeared into the grey scattered clouds. I was not alone on the long weekend. Across the lake at the Lewis Lake campground, I could hear the alternating sounds of the local radio station and dirtbikes. Dinner was rice and beans with cheese, accompanied by heavy metal blasting across the lake. That was the motivation I needed to continue walking for a few more hours. It was too noisy to camp here anyways. Walking along the Spring Lake logging road. 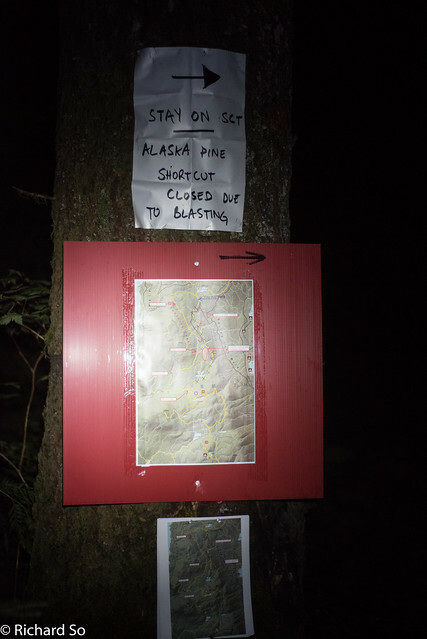 I kept an eye on any markers, and my maps to make sure I did not wander off onto the wrong logging road. A small propane canister stove, Vargo Titanium 1.3L pot. 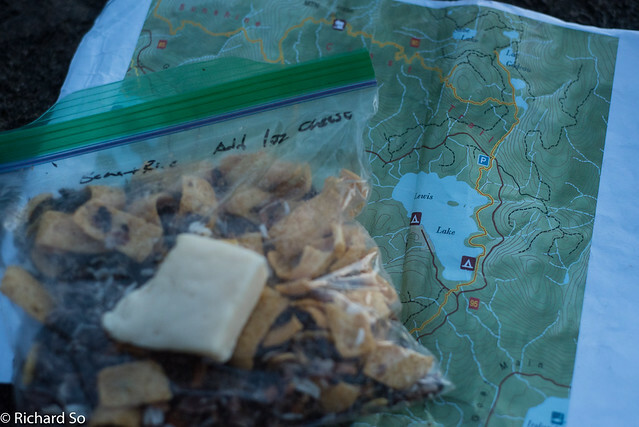 Guidebook, paper map, and my ziplock of dehydrated black bean flakes from Famous Foods, instant rice, Fritos, seasoning and a block of cheese. Beans and Rice. Add 1oz cheese. 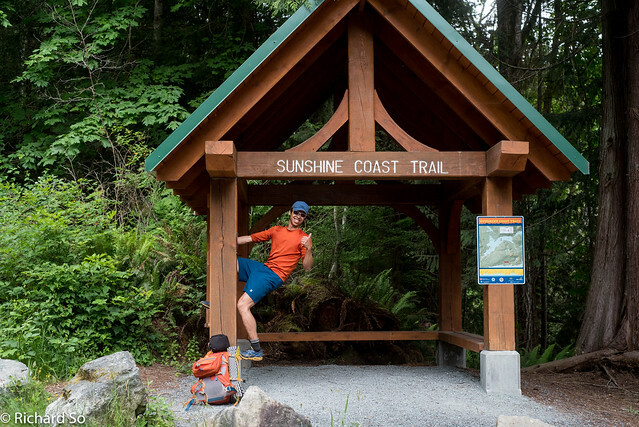 This section of the Sunshine Coast trail is a constantly evolving route. The trail follows a corridor betweeen working forests. 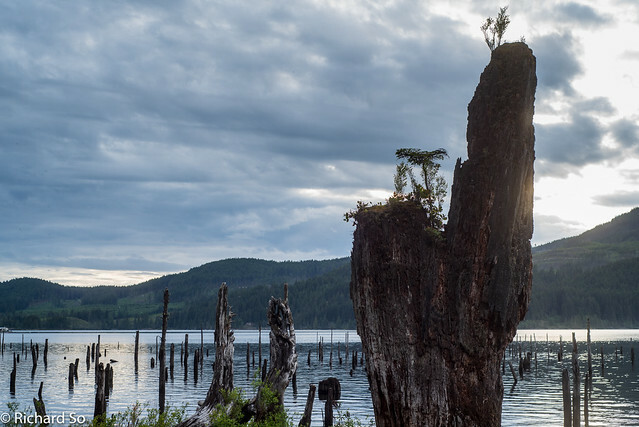 In the spring, the March Lake area was closed off due to new logging and the blasting of new roads. I stumbled out onto the logging road, where I found a very useful sign leading me to the March Lake detour. 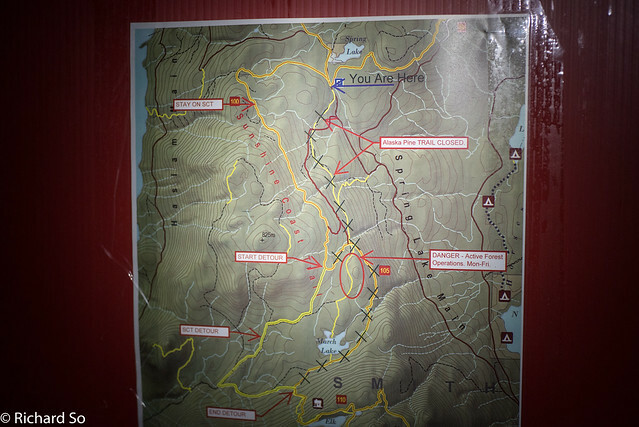 There were even copies of the Sunshine Coast Trail map, with the detour, annotated with the detour on the old roads, printed on waterproof paper for hikers to take. I recommend following the Sunshine Coast facebook group before heading off on your trip. 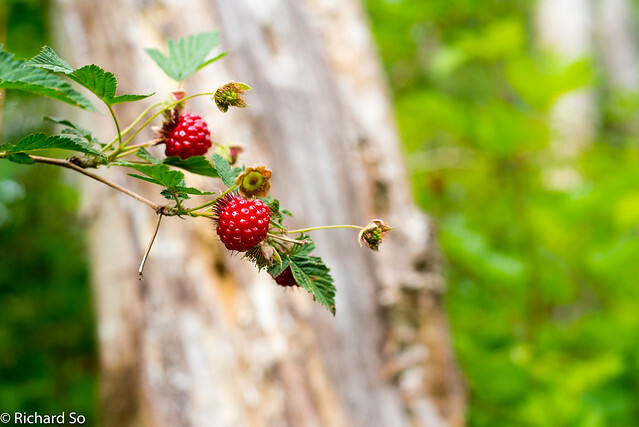 The logging company understands the needs of recreation and tourism, and marked re-route is always in place if needed. No shortcut for me tonight. Well-marked trail closures. This part was still confusing to me. I kept wondering where on the logging road I was. I relied on the maps and guidebook but I also had my phone with me, with the topo maps loaded. I hate getting lost on logging roads. The moon rises through buffer zone on the edge of the cutblock. The next section of the trail passes through cutblocks, along logging roads and old railroad grades in the forest. I was happy to hike this less scenic section by moonlight. 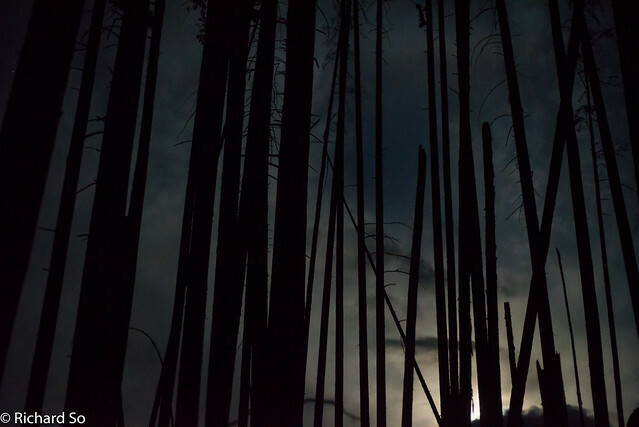 I could see the moon through the thin stands of trees on the edge of the trail, forming a narrow buffer zone beween the cutblock and my path. I had left the sounds of cilivizaiton behind at Lewis Lake. I was by myself again, or so I thought. 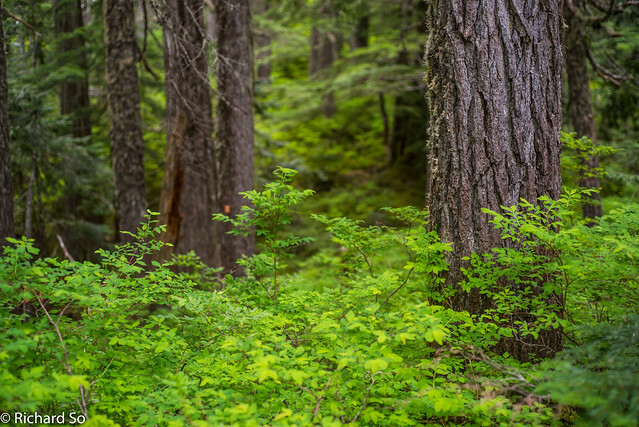 Walking along the logging road, I could hear a bear rustling down in the riparian zone below me. I would talk to myself and make noises whenever I saw evidence of bear. Going solo, I also carried bear spray just in case. Hearing the bear was motivation for me to pick up my pace. 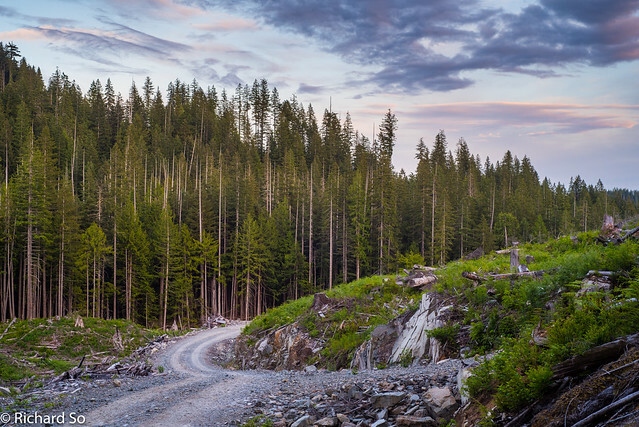 I continued the sufferest along the new logging road and then back into the historic railroad grade. 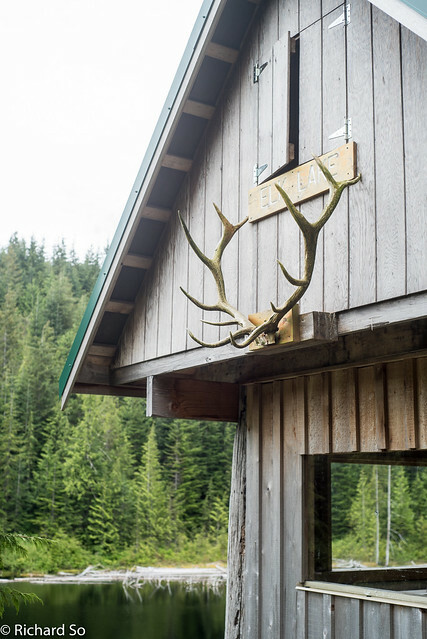 When I left Tin Hat Mountain, I knew it was unlikely I could get to the Elk Lake Hut to sleep in. It was close to midnight and I was ready to bivy anywhere. I decided to stop just before the 102km point, just in case my shoes turned into pumpkins at midnight. I could have kept going, but I didn't see the point as I could sleep for five hours, and start moving again in the morning somewhat rested. Total distance on Day 1 was 50km, which sounds just as long as this rambling blog post has turned into. I woke up at 5:45am on Sunday morning, ate a bar and packed up everything and left within fifteen minutes. Going light and tent-less, it was pretty simple to pack everything up and go. 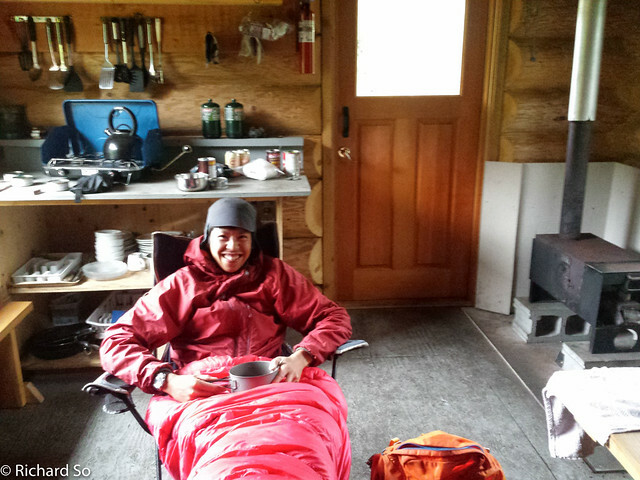 I brought a +3C sleeping bag and a Thermarest Z-lite for my sleeping system. I also brought a 200 weight merino wool baselayer and long johns for sleeping in. It was warmer than I expected on the trip and those were not needed. My morning "run" weaved along the old logging roads following taking the detour sections. I was jogging along and missed the March Lake / Elk Lake junction and ran about 500m beyond. I stopped seeing trail markers so I knew I was off the route. I had actually seen the wooden sign for March Lake, but didn't look to the right where the trail branches off the road, well marked and flagged. 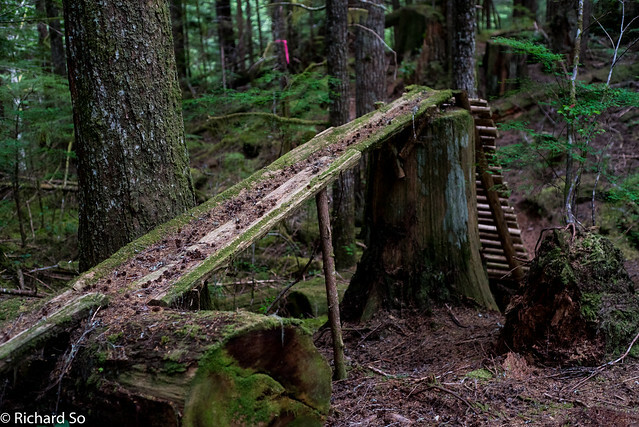 The Sunshine Coast trail isn't suitable for mountain biking. I don't think it's technically closed to biking, except for the northern section which is part of Malaspina provincial park. On the old logging roads, a bike would be so much faster. I just can't imagine wanting to bike the technical trail. There are better trails to ride around Powell River. 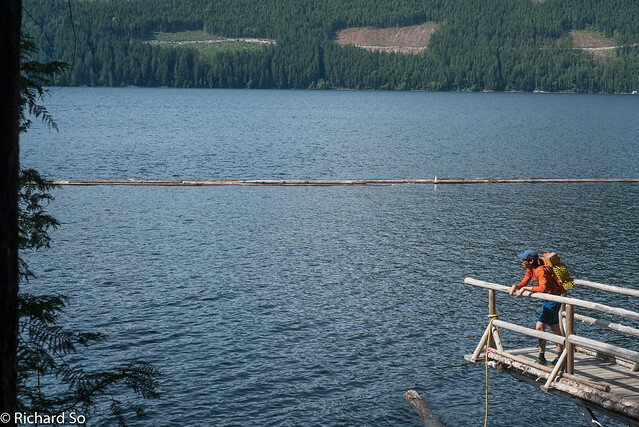 Elk Lake is a beautiful spot, with a swimming dock leading out. You can even go for a paddle on the lake. These huts are amazing. They are simple and well constructed, providing shelter from the elements and somewhere to sit and cook. 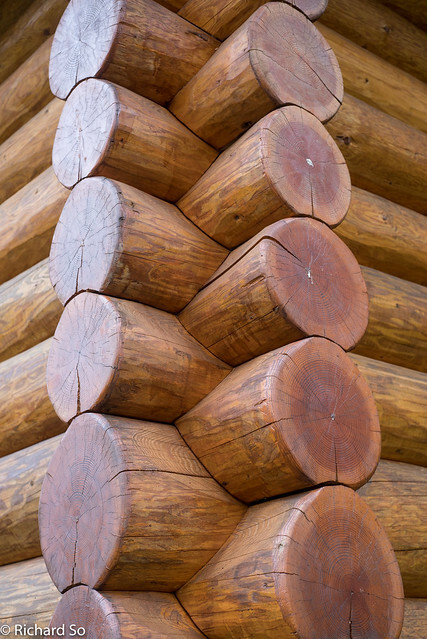 Some are fully enclosed and winterized with a pellet stove, which others are more simple. My favourite huts were the Mount Troubridge, Walt Hill and Tin Hat Cabin, simply due to their locations and construction. The Fairview Bay hut is also up there due to its position next to the ocean. I was telling some friends about the huts up here and they all thought I was talking about the Tetrahedron huts. Despite being listed on the Sunshine Coast website, and built in sequence since 2009, many people still don't know about them. People are even more surprised to hear that the huts are free to stay in and no reservations are required. 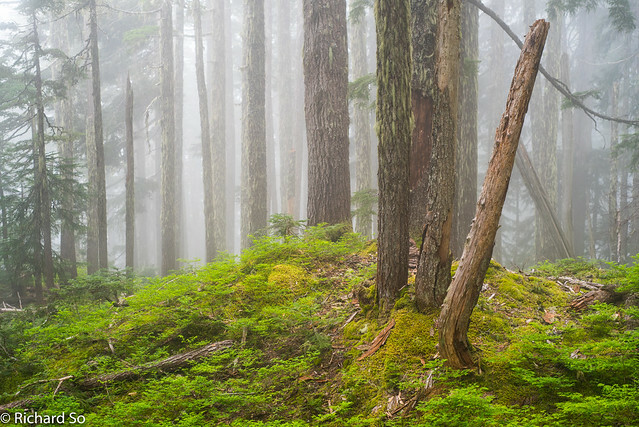 Thanks to the Powell River Wilderness and Parks Society for all their hard work in establishing this! 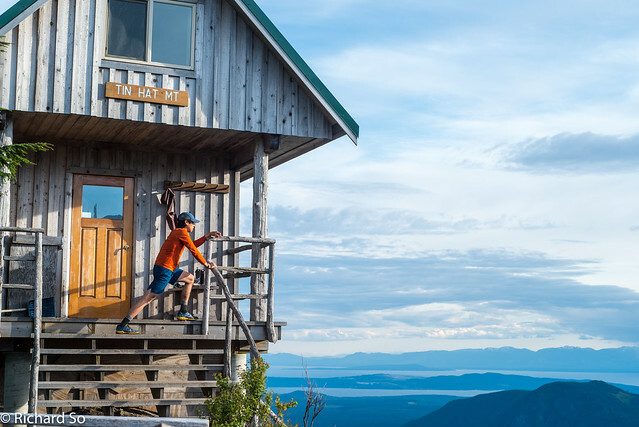 It's possible that when the trail and huts become more popular, a reseveration system could be created. The next section goes around Elk Lake towards Walt Hill, taking a series of old logging roads, the alder threatening to take over. I didn't feel like running after a big breakfast. However, there was significant distance to cover, the terrain was suitable for running. I was forced to jog again as the roads were flat or downhill. 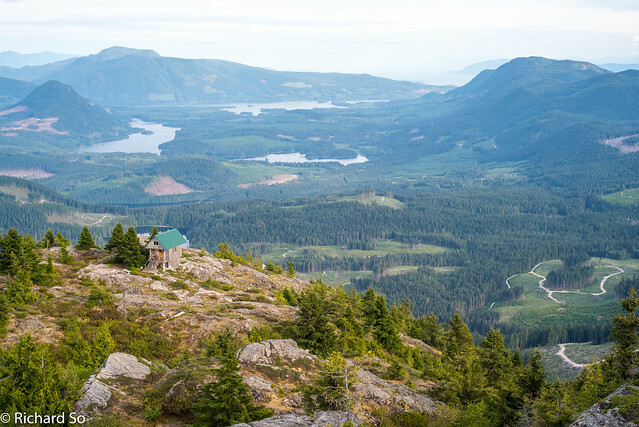 I carried on towards the Walt Hill hut, another high point of the Sunshine Coast trail. 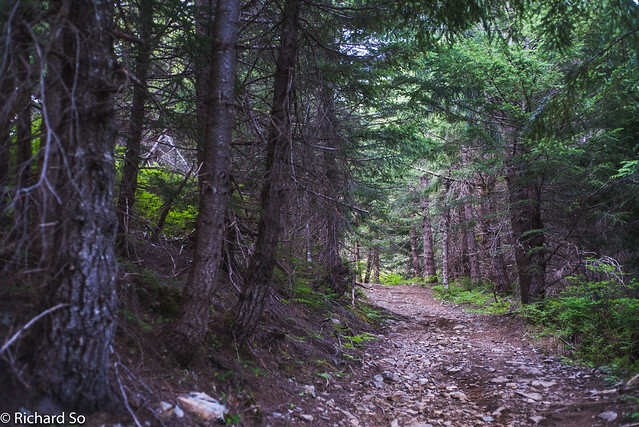 The trail weaves through high elevation old growth up here. 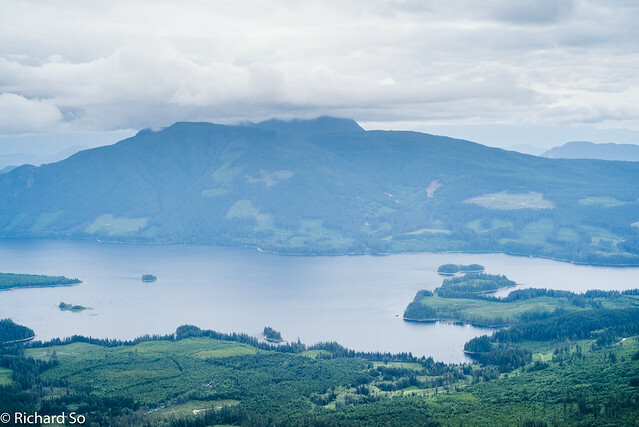 Up on the bluffs, looking across Vancouver Island, the Salish Sea and into the mountains, I could see sunshine here and on the water, and some darker clouds further into the mountains. There was a 60% chance of precipitation this weekend, but the EnviroCan forecast was wrong again and I enjoyed the clear views and sunshine. 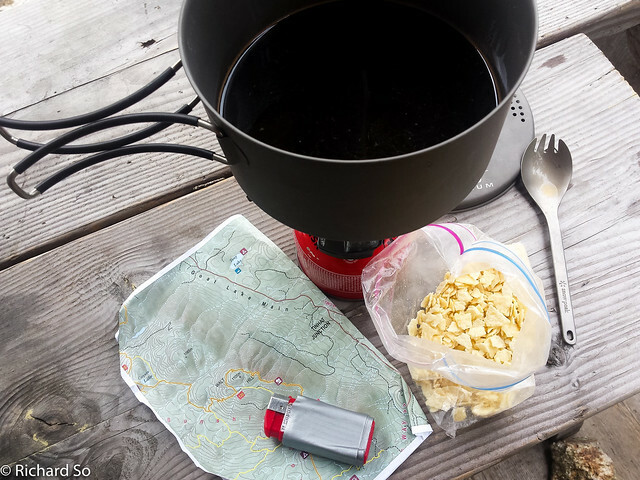 I stopped for brunch at noon at the cabin, brewing up some coffee and enjoying a bag of pringles. Once again, I was surprised to see nobody inside the cabin. 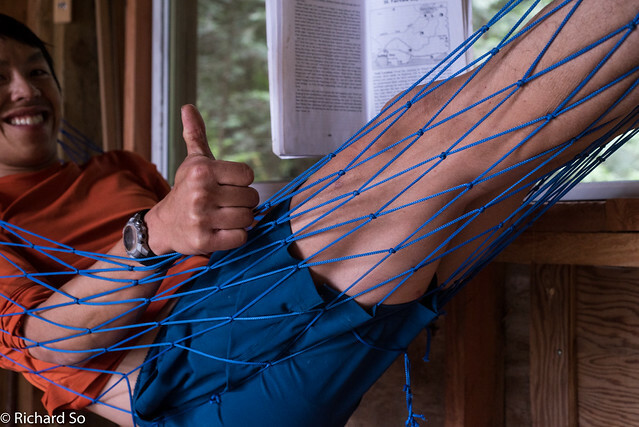 I lounged in a camp chair, and read through the descriptions of the next section of the trail. 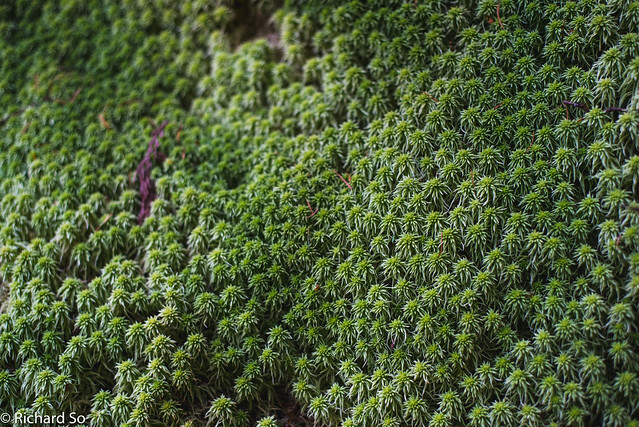 Above the bluff, tucked into the forest is the green roof of the Walt Hill hut. Lois Lake, with Mount Troubridge in the clouds. The climb to Elephant Lake and Mount Troubridge follows the right edge of the cutblocks at centre. I was happy to have my shoes off. It looks like I've stepped on glass shards with all the tape and bandages around my feet. This was all preventive. I finished the trip without a blister. I got confused again after the initial section through the old growth below Walt Hill. After jogging down through the nice forest, I ended up on a mix of old roads and mossy roads. I drank some water at Walt Creek, but in hindsight I should have filled up my water bladder here. I came up to a detour section where re-route puts you a multi-use road which spits you out onto the Conchie Main, above the old SCT, then along the road for a kilometre or so and then back onto the trail. Unlike the March Lake area, this was only sporadically marked with blue arrows spray painted for south-bound hikers. I wasn't worried about getting lost here, but as I ran along the road in the sun, I did wonder if I was actually on the right path. Soon enough though, I came up to another detour sign, with the complicated road plans marked out. Typical trail re-route signs. 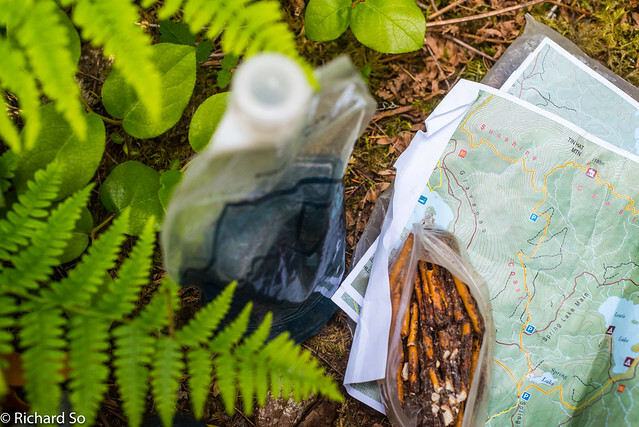 Check up on the latest trail conditions before you go. I re-entered the trail below the Conchie Main. It was only another six kilometres to the creek crossing below the Lois Dam. That would be my next water source. It was getting hot out in the early afternoon, and I was running out of water. I decided to not to run as much of the flat sections and tried to make sure I didn't over-exert myself here. The humid heat in the open cutblocks was wearing me out. I still hadn't seen anybody yet since leaving the Tin Hat Cabin. I ran through the bluffs, getting a view of the Lois Dam below me. I continued downwards and crossed Dixon Road. I could stop here and pull the plug. It was easy to walk a few kilometres down Dixon Road to my car. But it was only 3pm and despite being a bit thirsty I was feeling ok. I made the decision to keep going to Saltery Bay. 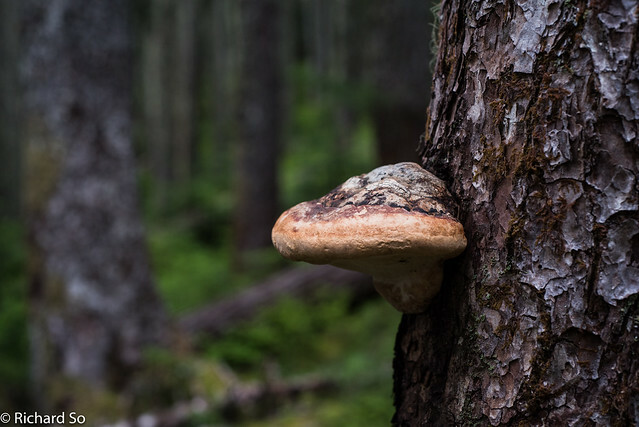 Just before the road, I came across a strange section of the trail, with encloypedias nailed to trees and moldy copies strewn across the forest floor. And then there was the random tea set I came across. I swear I wasn't hallucinating here! 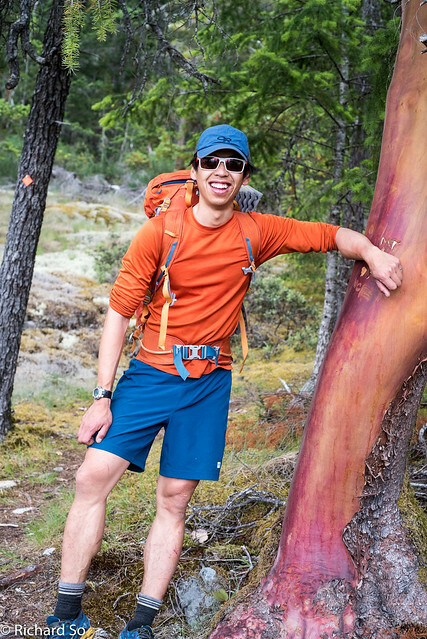 This is a mandatory photo op for hikers on the Sunshine Coast trail. The SCT crosses the Lois River under the Lois Lake Dam. 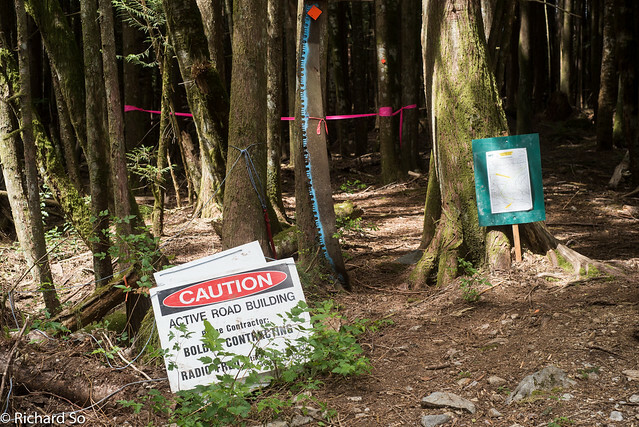 Signs warn hikers to evacuate the area in case the spill gates are opened, signaled by sirens. In these dry conditions, it was an easy ford, the water level was low, with boulders easily hopped across on. I stopped for water here, having run out half an hour ago. 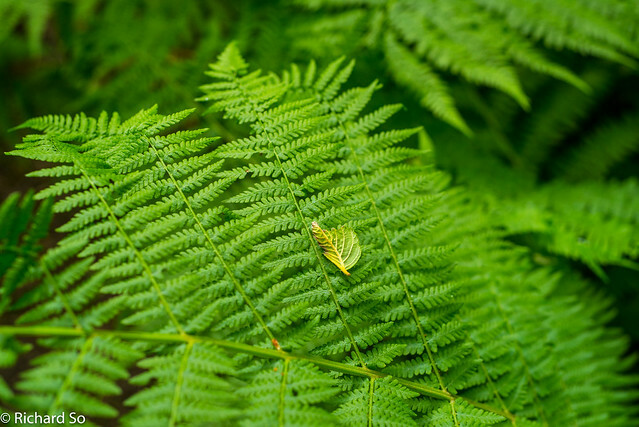 I picked up the trail on the other side, climbing up the bank, and then onto a gentle gradient with some muddy patches through lush sword ferns and salal. Everything was so green here. I was feeling better now, and able to jog again. I stepped out onto the Stillwater Main, with a short section of open logging road to go up on, and then left onto the Lois Lake trail. I was even offered a ride up the hill by some ATVers, but I declined as it was a very short hill. Lush forest. The trail is still easy to follow here. 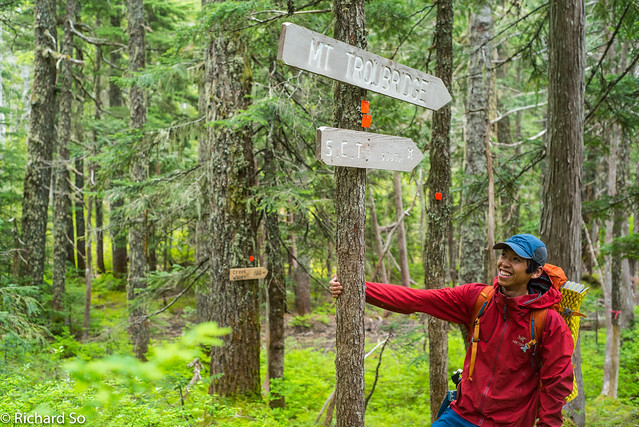 When I was reading through the Sunshine Coast Trail book, I found that the trail difficulties described as moderate were usually runnable, and the difficult sections runnable on the downhill direction. The Lois Lakeshore section is described as moderate, and it was nice ramble along the shore line for seven kilometres. I had a good mix of jogging and walking along the shore line. And also sitting posed for the camera too. I reached the Branch 41 campsite on the east shore of Lois Lake at 5pm. At this point, I briefly questioned my self induced sufferfest, while everybody else was camped out on the lake enjoying some cold beers and hot dogs over a campfire. Everybody in Powell River seems friendly. I walked up to a group of campers, wondering if could buy a beer off them. Immediately, Bill offered me a beer and wondered why I was out hiking. I sat down on the picnic table, and cracked open what was likely the most delicious Budweiser I have ever tasted. And the second one tasted even better. Bill was a logging truck driver, familiar with hikers wandering around in the forest in the area. I told them I had hiked from Powell River (although not that I started yesterday morning, that might have seemed nuts of them! ), and that I had another 10 kilometres of hiking to go, if not more. Bill asked me if I was hungry, and I told him I could eat somthing. All of a sudden I had two sandwiches in front of me, a tub of margarine and cold cuts. I wasn't at risk of running out of food, but this was just too good to pass up. The Powell River hospiatlity is something else. We talked about the trail, about the different huts, and the people who were hiking on the trails. After finishing off two pepsis, I was ready to leave at 6pm. 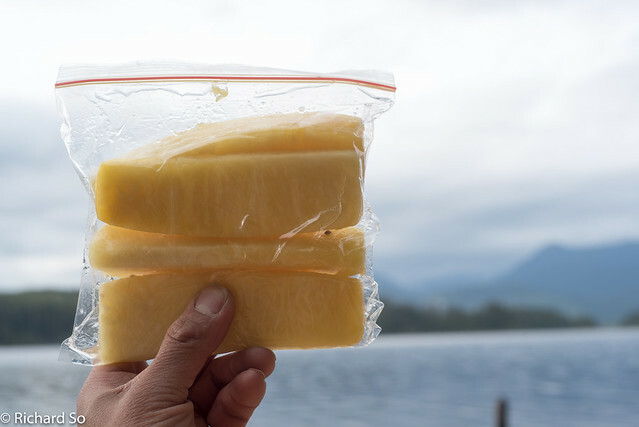 Just before leaving, Bill handed me a ziplock bag of cut pineapples. 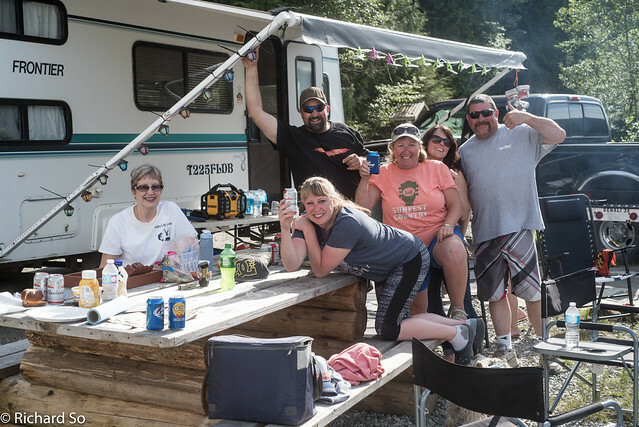 These were some of the nicest campers I've ever met! Thanks for the beer and food! 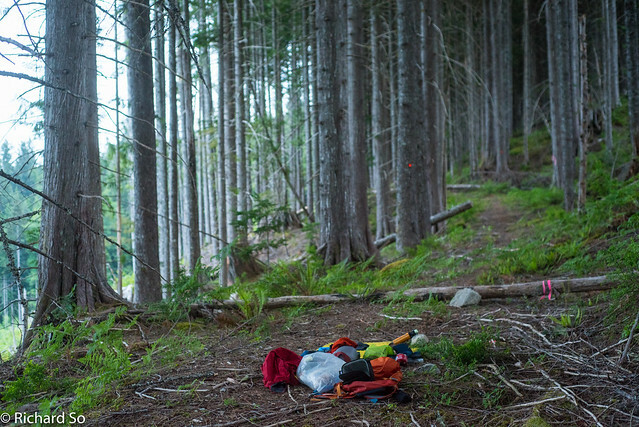 I walked past the camp area, back into the forest for two kilometres to the Lois Point campsite. I spotted a nice beach here. The sun was poking out of the clouds, and I hadn't gone for a swim yet this trip. That was poor form given all the nice swimming lakes that I've passed through, so I jumped into the lake and hung out on the beach for a while longer. A quiet spot on Lois Lake near Lois Point. I didn't get moving until 7pm, but now I was well-rested and recovered. 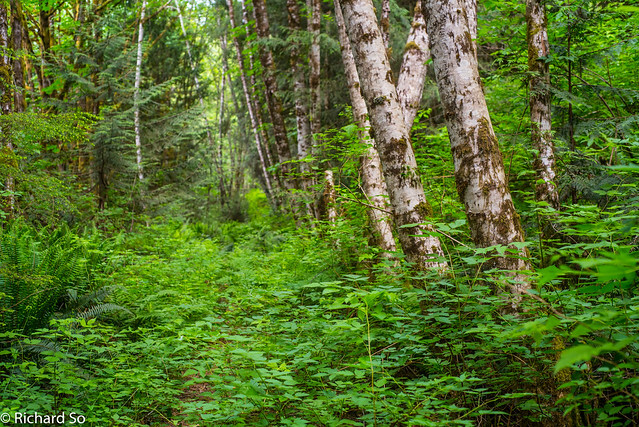 The next part of the trail was really nice, as it weaves through riparian zones and ravines and second-growth trees, rolling up and down towards Lois Main, another logging road. I was enjoying this section of the trail, and kept thinking about coming back without the pack and running the Troubridge Section next time. 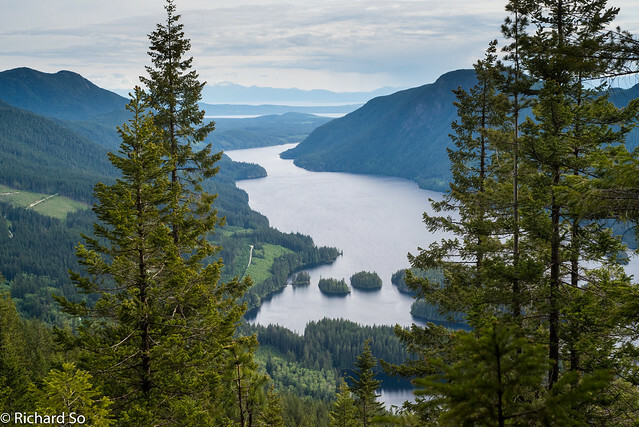 Saltery Bay to Mount Troubridge is approximately 42 kilometres. Eagle Walz describes this as a "marathon with attitude, because it's not some flat and paved half-morning sweat, but a marathon with a mountain thrown in. 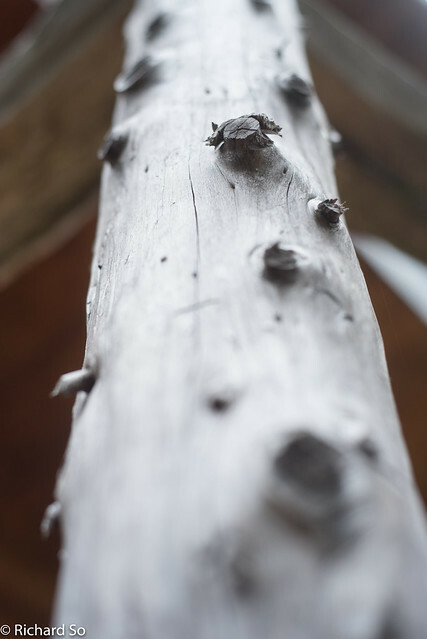 Fabulois views and long stretches of old grwoth are part of hte deal, if you ever look up from your toes." 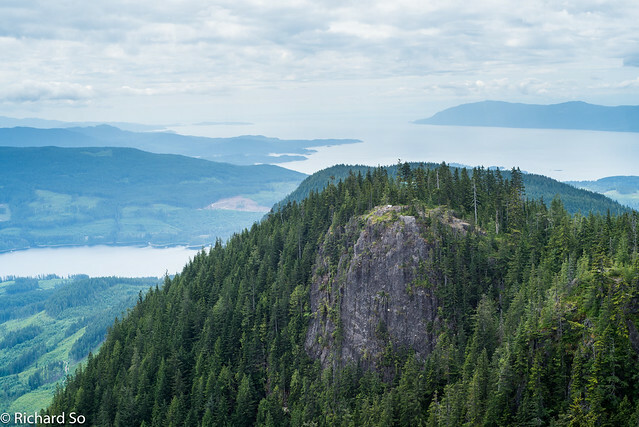 From Lois Main, the Sunshine Coast trail now begins climbing up. The first part followed a beautiful old bike trail, with relicts between loamy flowy sections of the trail. I walked past the Golden Stanley Hut, the newest addition to the network of huts on the trail. Once again, there was nobody else here. It was a beautiful spot, deep in the forest, with the sound of Stanley Creek flowing nearby. 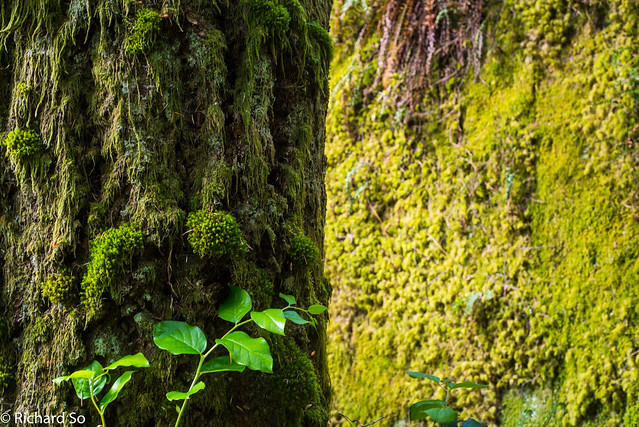 You might have thought the Hobbits and Ewoks co-lived here. I looked around, and briefly thought about staying but it was only 8pm. So upwards I went! I knew that the next section of the climb woud be easy to follow even in the dark, as it linked up a series of old logging roads. When I say old logging road, I don't mean the cross-ditch alder choked nightmares we tend to have around Squamish or Chilliwack. 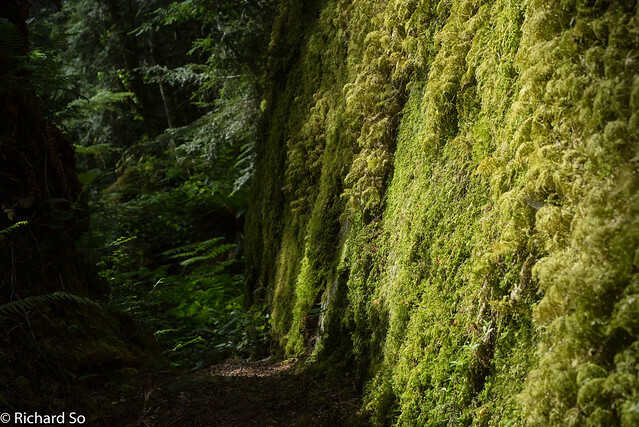 Some of the logging roads were just a green tunnel, the surface a layer of moss mulch and needles. These old roads were a pleasure on walk on, soft moss and dirt rather than just a knee-jarring rubble road. It was easy going, even in the dark. None of the markers are reflective in this section of the trail. 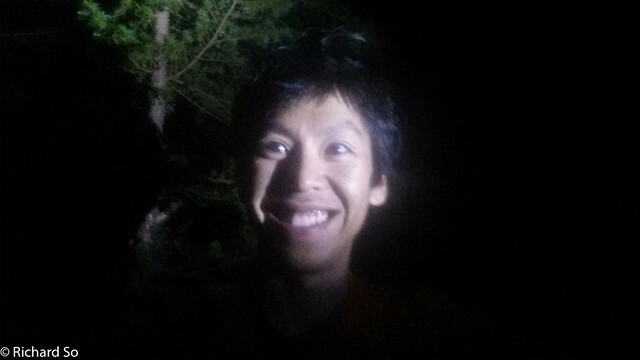 I suffered just for a few minutes, when I stopped for a snack at around 9pm, around 700m elevation. 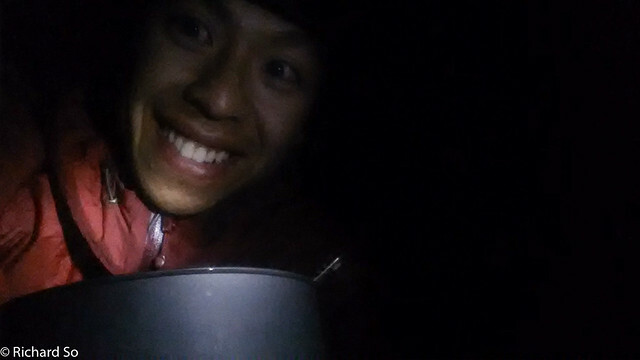 The sun was fading, I pulled out my headlamp and ate way too many chocolate-coconut oil coated cashews chunks at once. I started dry heaving, maybe I was going a bit too fast uphill beforehand. Anyways, some coughing, more coughing, some rest, and I was back on my feet jogging up the roads again. There was less than ten kilometres to go to the Troubridge hut. I was just getting a little tired, as I'm sure you are reading this endless dribble about hiking. Seriously, you can just ignore the rest of the details, catch the ferry to Powell River and start walking. It's that easy, and that's all the beta you really need. But read on if you insist. A derelict trail feature. Why bike, when you can hike? The sunset through the forest canopy. I started from somewhere over there. I am definitely going crazy at this point. I thought I could camp at Elephant Lake if I needed to. 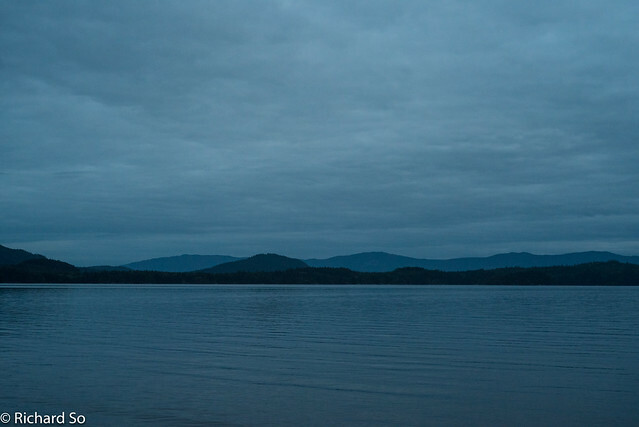 The book describes a basic camp spot on the lake shore, but as I skirted along the south shore, the symphony of frogs chirping pierced through the darkness. The noise was incredible, and there was no way I was stopping here tonight. I stopped at the creek flowing into the lake, wondering if 10pm was dinner time or not. Nope, not yet. I didn't want to carry extra water weight, so I was careful in planning where I filled up with water. I used a LifeStraw for any creeks I came upon, and filled my 1L soft bladder as needed. I brought Pristine drops for treating all my water. 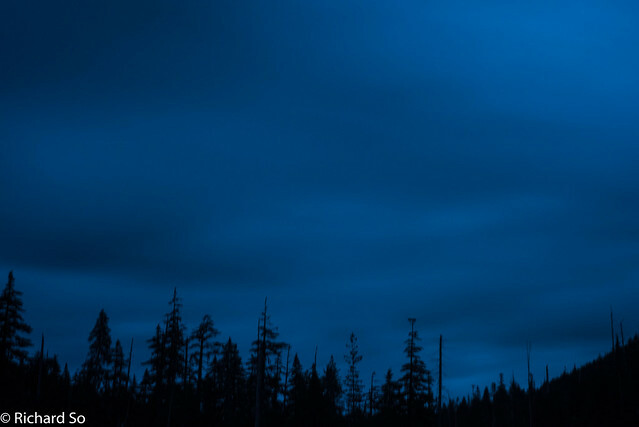 The full moon rising behind the wispy clouds casted a faint glow over the otherwise dark forest. I turned right onto the new trail to Troubridge, catching a glimpse of the city lights on Vancouver Island through the open forest. At the junction, I turned left towards the hut, my headlamp now fading. I brought three AA batteries anticipating some night walking, but I didn't think I would do so much of it. I only had a Zebralight HF51 with me. At it's highest setting, the HF51 is 200 lumens, with burn time of 0.9 hours, or 100 lumens for 2.4 hours. I think I hiked for a total of 5-6 hours in the dark over the last two days. Since then, I've upgraded to a more powerful headlamp with a longer burn time. 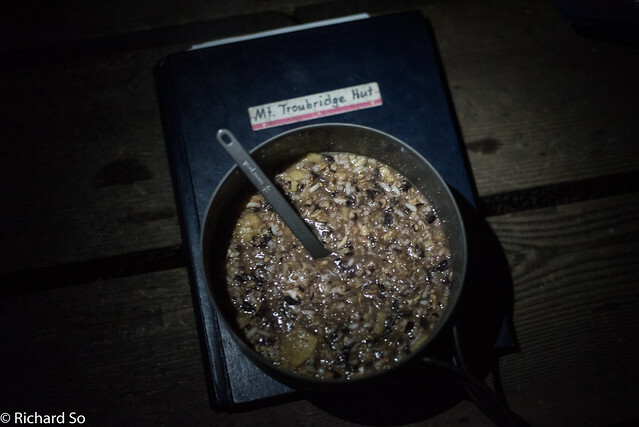 More rice and beans for dinner at the Mount Troubridge Hut. Dinner at 11:45pm. Inside the hut, there was food scattered across both the table and the counter top. There were only two people upstairs, snoring away. I was trying to figure out who these two people might be, by scanning through the food they brought. There were many cans of tuna, and Chunky's soup and chocolate. 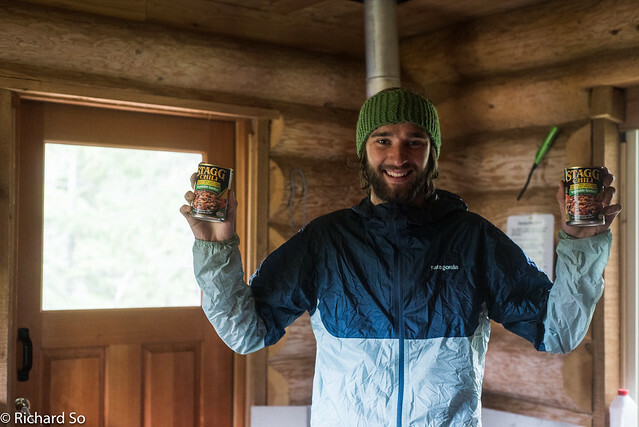 After twelve years, I think I finally mastered the backcountry rice and beans combo after the disaster with Jen and Oker. First, use minute rice and dehydrated bean flakes. Second, add fats. Third, don't add apple cinnamon oatmeal and whole kidney beans and curry paste together. I was going to sleep upstairs. But it was too hot upstairs and I didn't have my earplugs with me. So I went back downstairs and slept on the hut floor. Five minutes later, I could hear a small mouse running around. I moved two benches together and slept on that. A few minutes later, I could hear the mouse running around on the table top, trying to get into the food that was left out. I moved their food higher up, hanging up some of it. The bench was too short to sleep on, a few inches too short. I went outside onto the porch to sleep. Another fifteen hours on the go, a perfect day out. I woke up at 6am to a light drizzle outside. 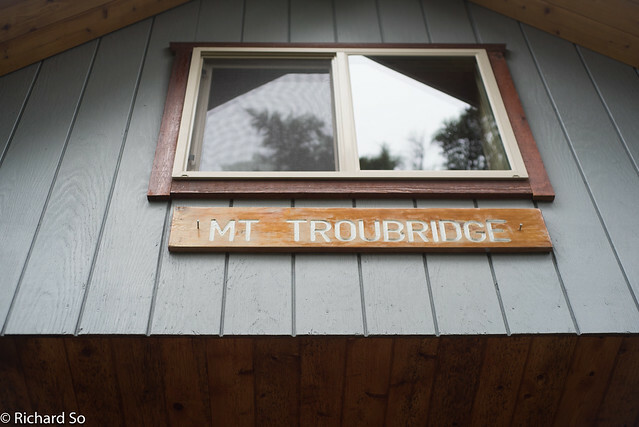 The Mount Troubridge area tends to stay in the clouds while everywhere else is clear. This was the only rain of the weekend up here on the Sunshine Coast. I went back inside, as the bugs woke up at the same time, a convenient alarm. 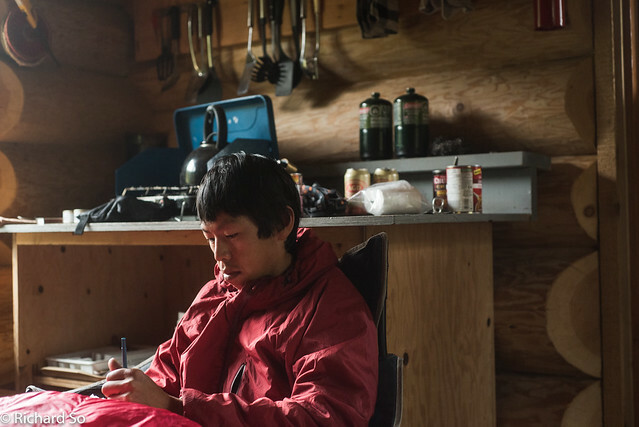 I hung around inside the hut, stretching and taping up my feet. Twenty kilometres left, almost all downhill to Saltery Bay. I figured it would only take me about four to five hours. The two guys in the hut were from Austria and Finland, in Canada to ski and study. I asked them about the cans of food. 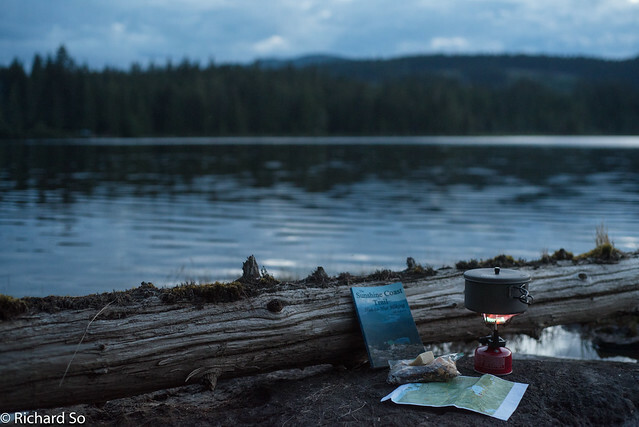 They didn't want to buy a stove here for their only backpacking trip. Hence, all their food didn't require a stove, for the next five days. 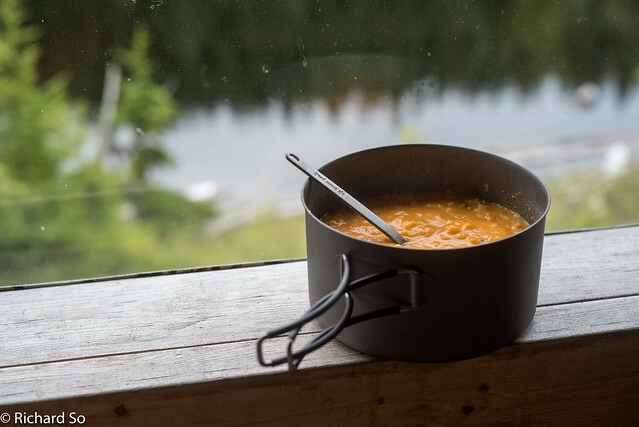 Leaving the stove behind can offers benefits aside from the obvious weight saving of the pot and stove. Your meals are simplfied. 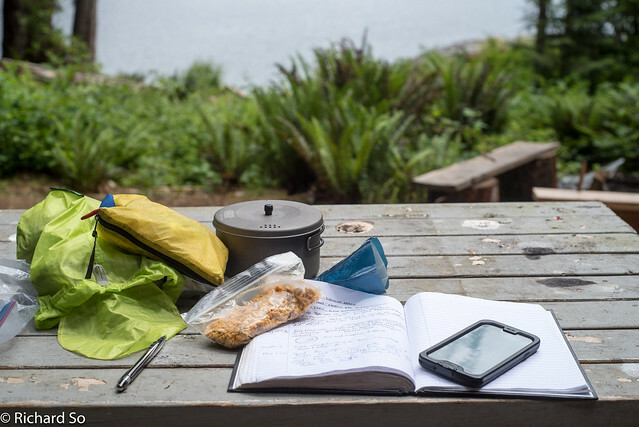 There is no cooking time and everything can be eaten on the go. 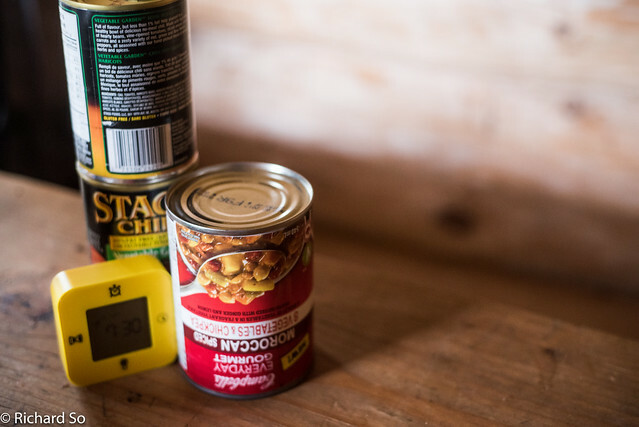 I almost left my stove behind too, but I decided the weight savings were negligible once I had to pack food not requiring a stove (bars, pita and dehydrated hummus) or extra time for soaking (cold ramen noodles). The danger of the chair. Once you sit down, it's hard to get moving again. The guys were loving the fact that I had cell phone reception up here to update them on the world news. The Austrian election and world hockey championship. It's all downhill from here onwards, I was pretty happy about that. We all left at 9:30am. A short walk back down to the junction together and I was off again northbound by myself. A short walk leads to a good water source, there is nothing except for a swampy pond next to the hut. 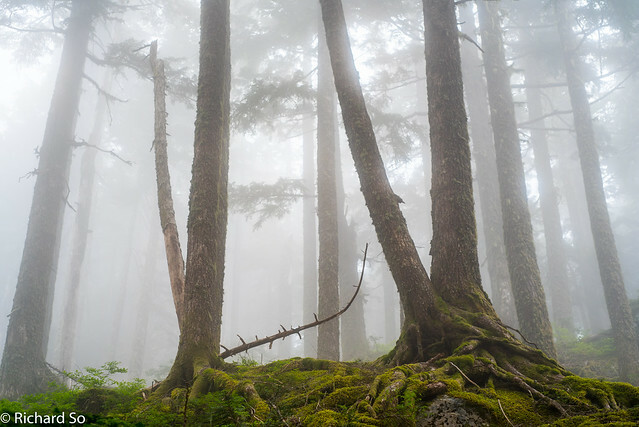 I continued up to the summit of Mount Troubridge, surrounded by fog. I'll come back on a clear day for the view. There were just patches of snow up here. 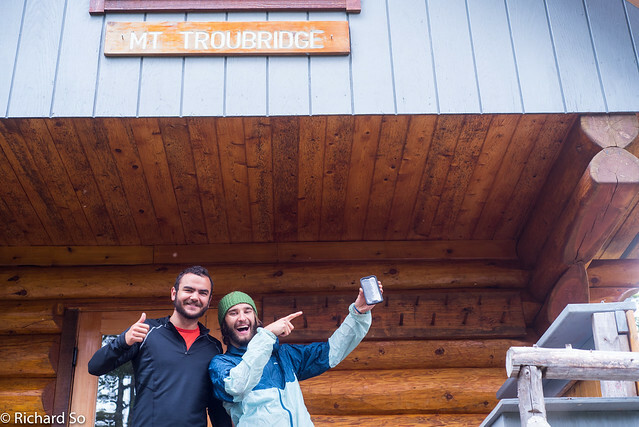 The Mount Troubridge and Walt Hill Hut are popular snowshoeing destinations in the winter. 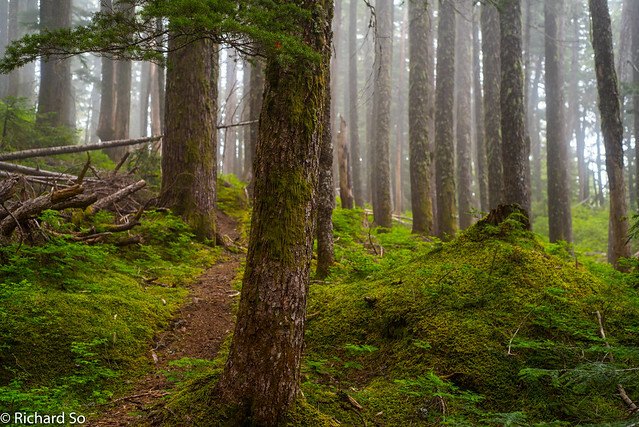 The trail down the east side of Mount Troubridge passes through old growth forests, which were enshrouded in the mist as I descended. The trail was very runnable, soft and forgiving loam. I was jogging, but I decided to slow down to appreciate my surroundings. I would start jogging, see something and have to stop to take a photo. If anybody else was here with me, they would have been so frustrated at my pace. 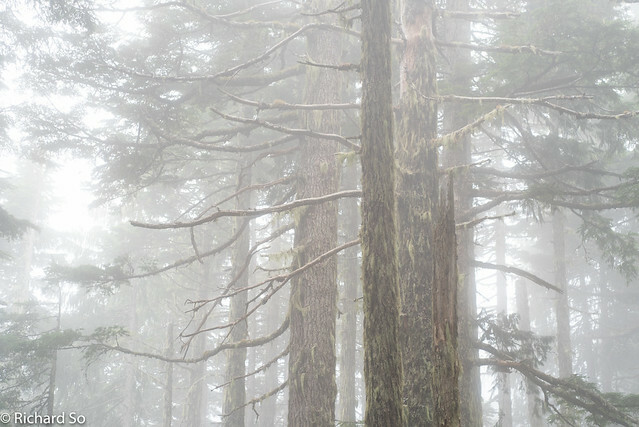 My photos don't really do justice to the magic within a stand of old growth on a misty day. You'll have to go experience it yourself. 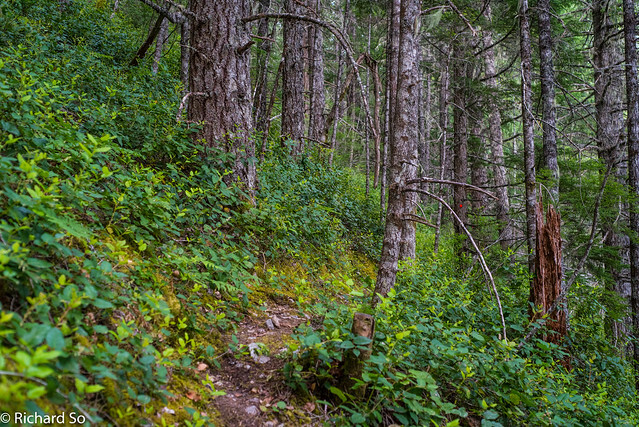 After a nice section of old growth, the trail follows the edge of a cutblock and then into a bushy section through a cutblock, what was once old growth a few years earlier and then down to the Saltery Bay Main. Rich at the junction. I was very careful to not hike past this junction during the night. Less than 20km to Saltery Bay! I dropped through some more nice forest and bluffs with short sections of up, down to the junction between Fairview Bay and Rainy Lake. Going right was faster, I would drop down to Rainy Lake, make a small climb up to Blue Grouse Ridge and then drop down through trails and old roads, definitely more runnable. I believe this is the route that the FKT attempst take. 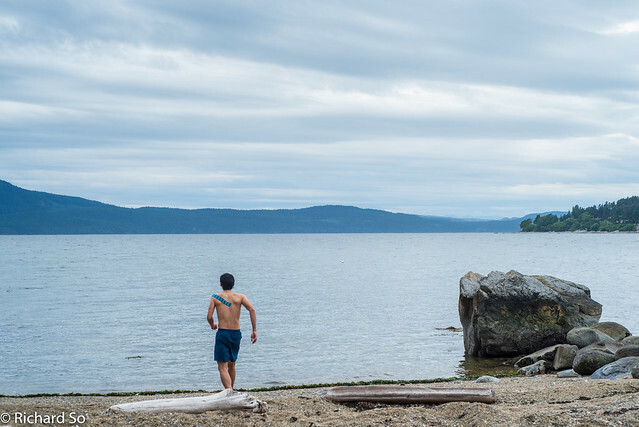 On the other hand, the trail from Fairview Bay to Saltery Bay follows the coast, a more scenic undulating route through arbutus trees, rocky bays and bluffs. I decided to take the longer route, dropping down to Fairview Bay. There is another hut here, with a waterfront view. There were only two other campers here in this pictureseque bay facing Jervis Inlet. Does nobody come here on a long weekend? The hut was empty, but there was a hammock strung up inside. I was in no rush, so I took a nap and didn't leave the hut until 1pm, nearly an hour spent doing exactly nothing. It was very satisfying. Eating the last of my snacks, this time the Indian chickpea mix. 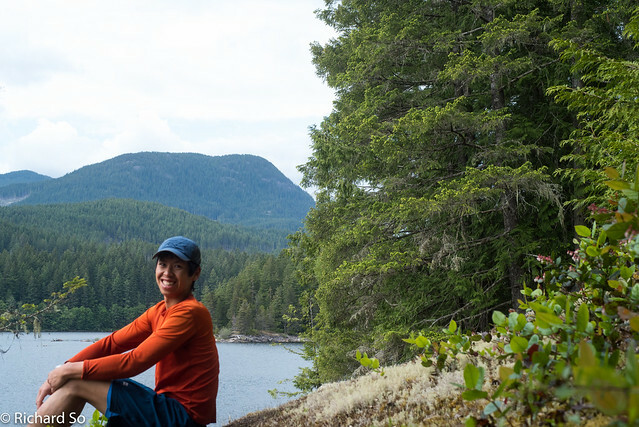 The Sunshine Coast trail now winds up and down. I reached one nice stretch of rocky bluffs and arbutus trees with a great view of Jervis Inlet just before Pirates Cove. I saw a hiker, Sharon, coming up the trail, so I asked her to take a photo of me. I was just hiking by myself and setting up the camera for a self-portrait can be slow. It turns out she was planning to head back to Saltery Bay, and was happy to drive me back to my car at Lang Bay. A total fluke and we walked out the last three kilometres together. I walked right past Sharon's car, as in my mind I thought I had further to go. My original plan if I made it here, was to try and hitch a ride off a hiker or somebody coming off the ferry. The last option to just to run the 12.5km along the road, something I was not looking forward to. I totally lucked out though. I asked Sharon where a good place to swim would be. Well the trend of friendly people from Powell River continued, she answered that the best place to swim was the ocean in front of her parent's place, followed by a soak in their hot tub. They even invited me to stay for dinner too. Me, a bottom-less pit, no less after three days of slogging. Thanks so much! The final part of my weekend of smiley suffering. I detoured into Powell River, with one last "hut" to visit, Townsite Brewing. The flight of beer was delicious after 128km of hiking over three days. Sunshine Coast Trail, check! A twelve year project completed. I couldn't do this before, as Townsite Brewing didn't exist then, and I was underage too! Pre-dinner snack. 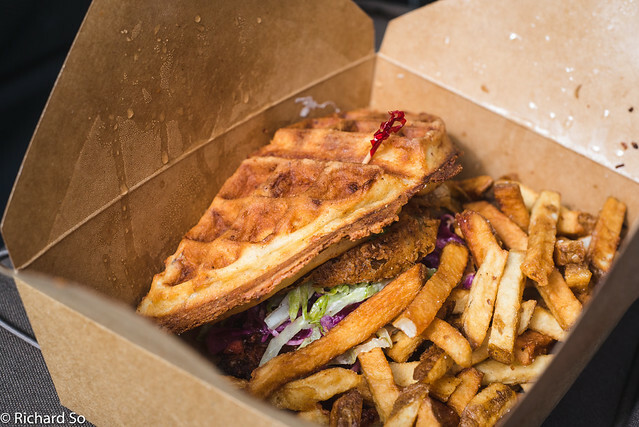 Fried chicken waffles from Coastal Cookery A solid option for food in Powell River. I was eating quite a bit on the trip, but there's only so much food you can carry and food you can eat while on the go. I caught the 9:25pm ferry from Saltery Bay, drove across to Langdale, slept in my car, and caught the 6:30am ferry to Horseshoe Bay. A perfect way to spend the long weekend. In the end, I covered 128 kilometres. My non-sleeping time was somewhere around 35 hours. A nice stroll in the park. Lots of fun. Just like my hike, this trip report got a little longer than I expected. I know there are more details than you likely care to read about. 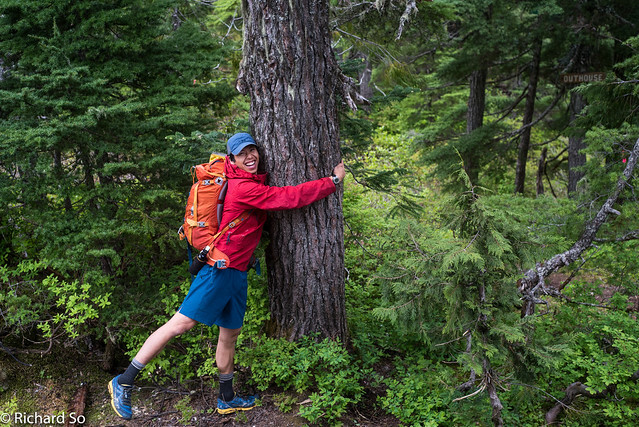 It might also be the longest trip report for a hike of the Sunshine Coast trail. Before setting off on this trip, I cound only find a handful of trip reports. As the trail becomes more popular, I think there will be more trip reports to read if you're into that kind of thing. 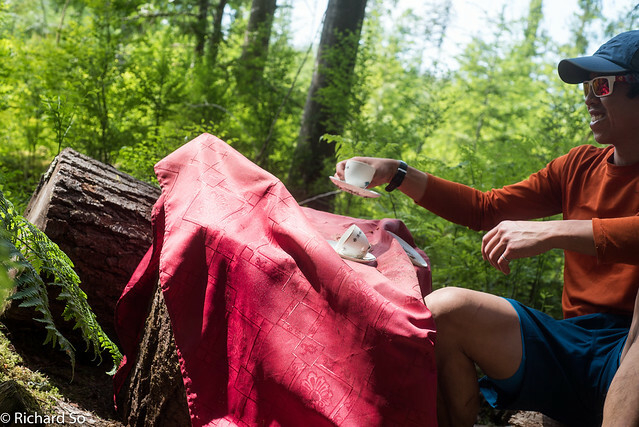 Otherwise as I alluded to earlier, just pack your bag, leave your tent behind and go explore the Sunshine Coast trail. It is well worth visiting. Hike it, run it, the whole thing in one go, sections at a time, visit the huts, swim in the lakes and enjoy the quiet trails. It's unique in it's own way and a great way to spend a few days or a week outside. I know I'll be back for Round 3. 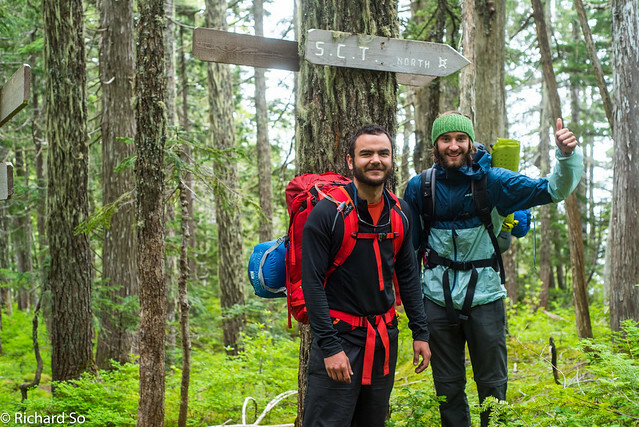 Hike Bike Travel's "The Sunshine Coast Trail - What you need to know before you go"
Awesome report Rich! Much better scenery that I would have expected. If I can offload the kids somehow I will give it a crack. There are definitely some nice spots. There are also some boring low-land forested spot. The area around Mount Troubridge is quite nice with views, similarly the area around Tin Hat Mountain. It's easy to plan a shorter trip to visit those sections, skipping on some of the less-attractive sections that just walk next to cutblocks (abit with a buffer zone). The north end is also quite nice too. Just don't expect this to be a beach walk. ala West Coast trail. Love this! Thanks for sharing. I am wondering about food and bears. Is food ok stored inside the huts? Hi Rich, Great post, thank you! How did yo manage water?